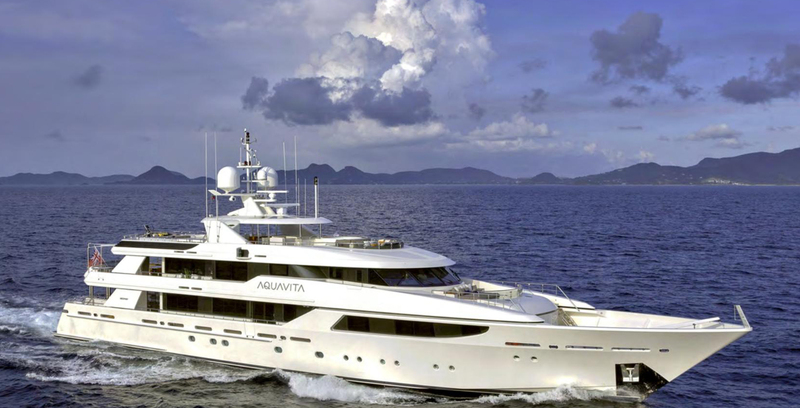 Luxury motor yacht AQUAVITA (ex XILONEN) was built by Westport in 2009 and measures 49.99m (164ft). 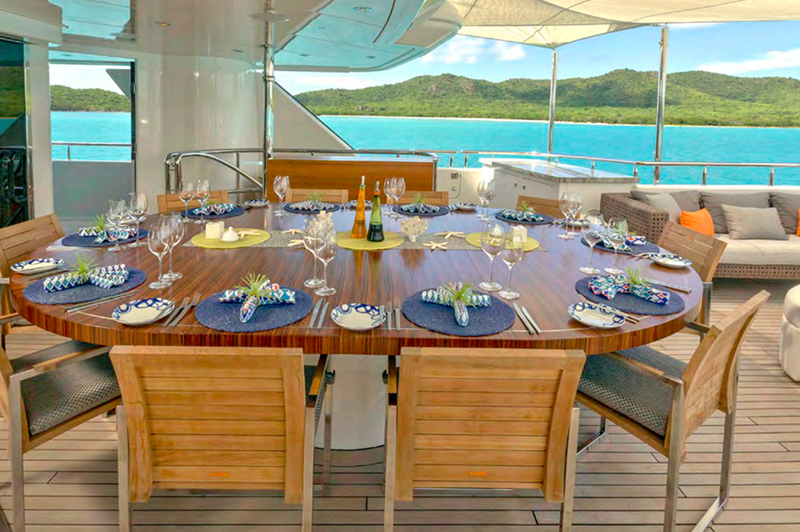 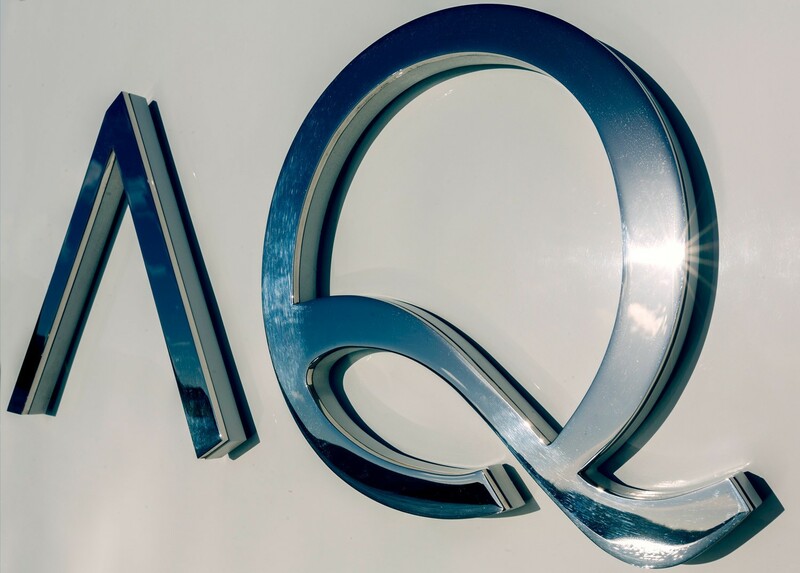 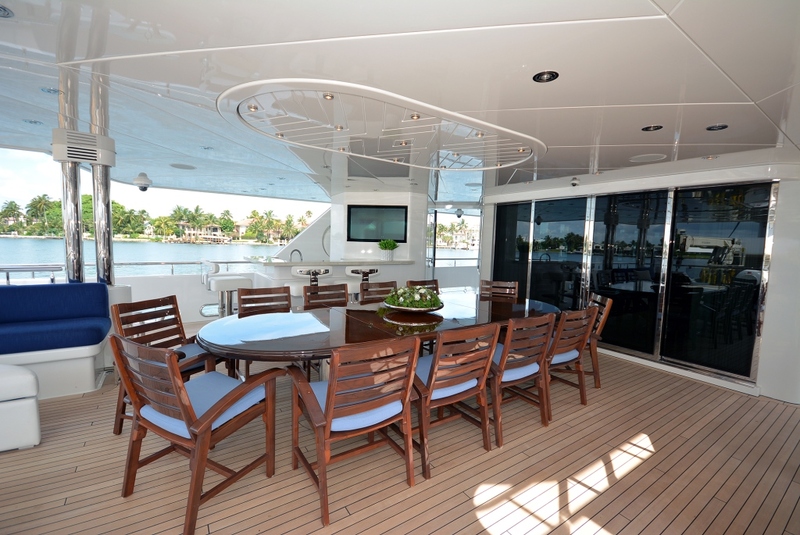 Having undergone a major refit in 2014, AQUAVITA features well-appointed, modern indoor and outdoor spaces, ideal for entertaining and relaxing. 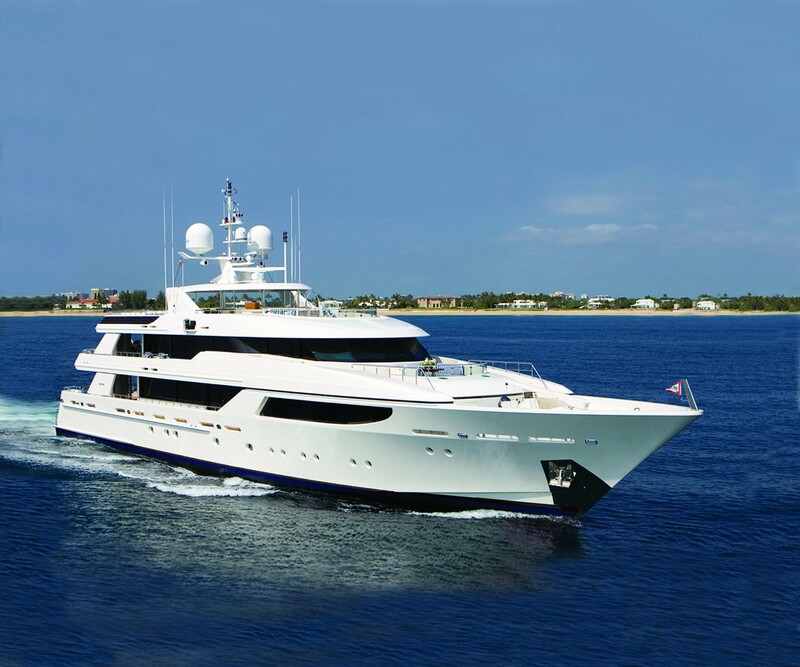 Offering accommodation for up to 12 charter guests, she is the ideal choice a luxury yacht charter. 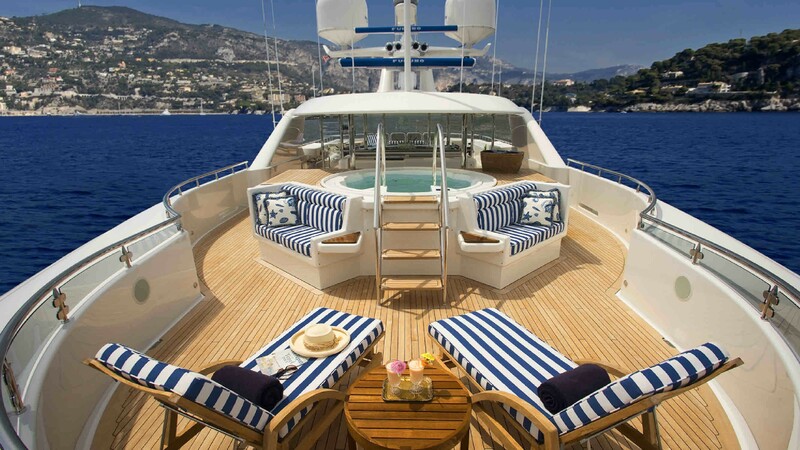 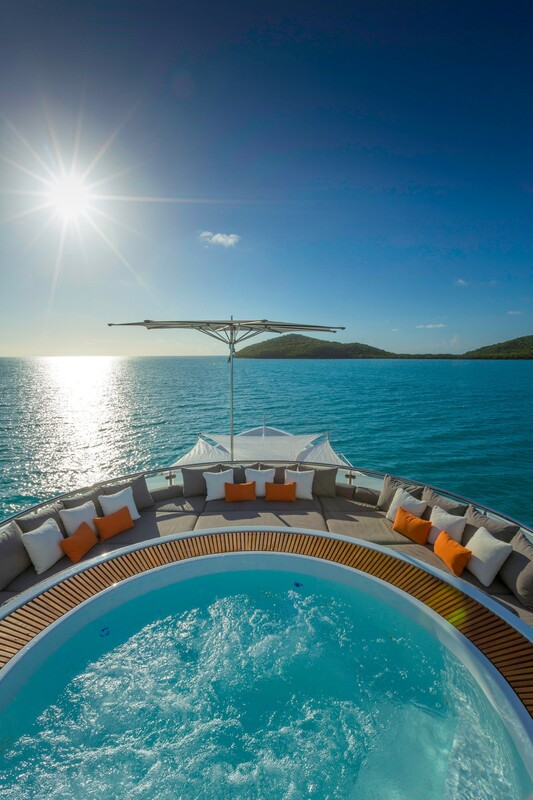 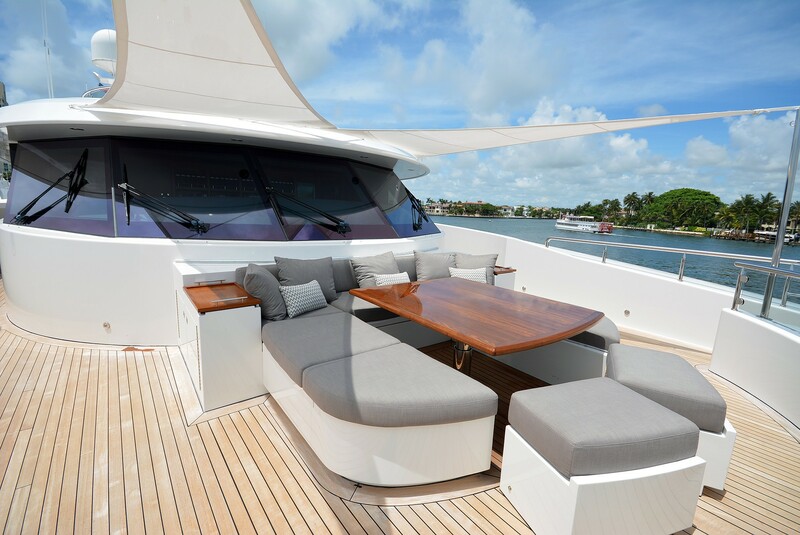 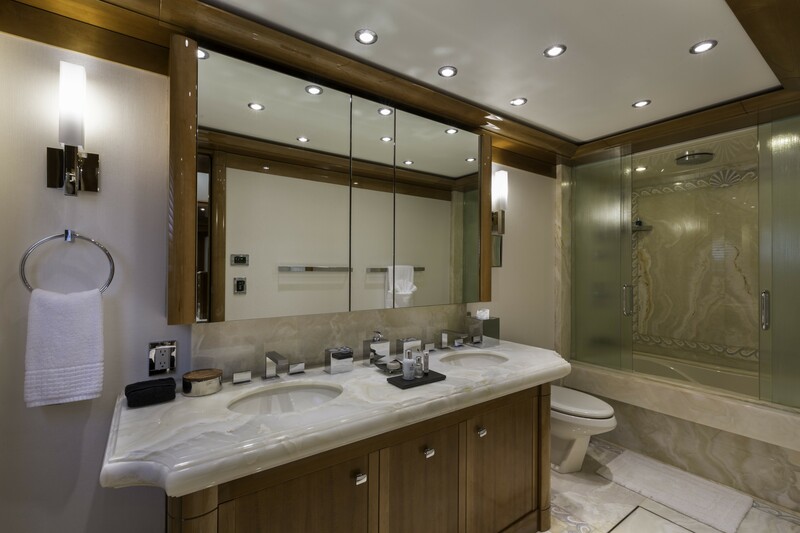 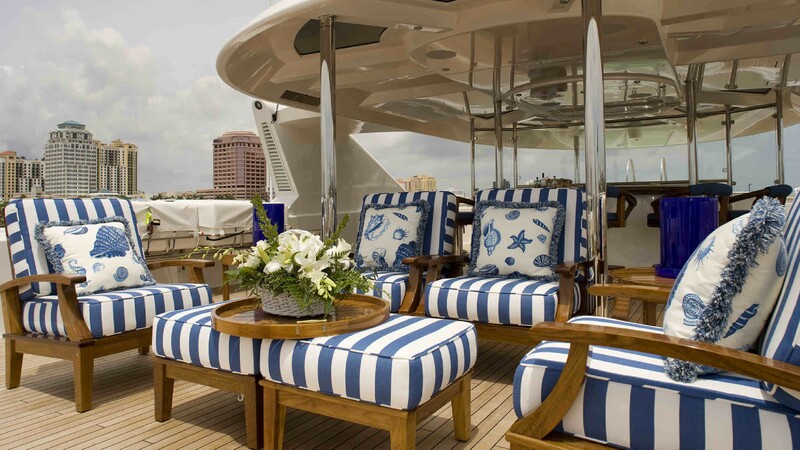 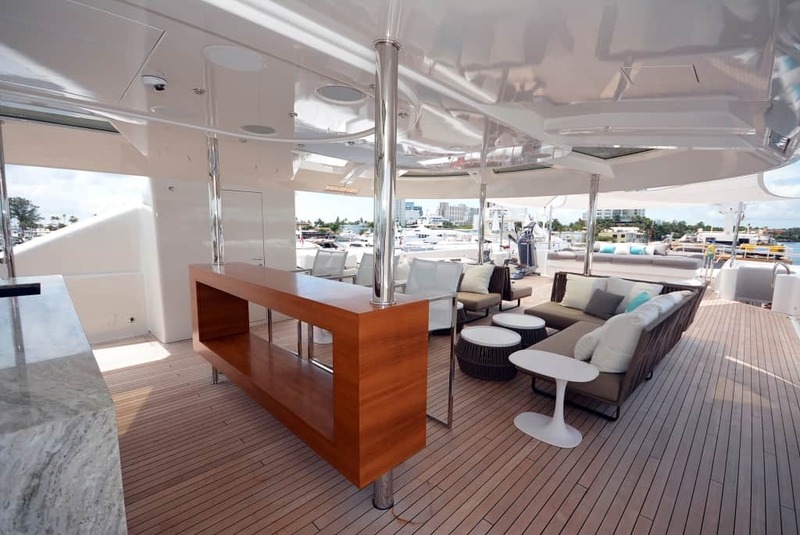 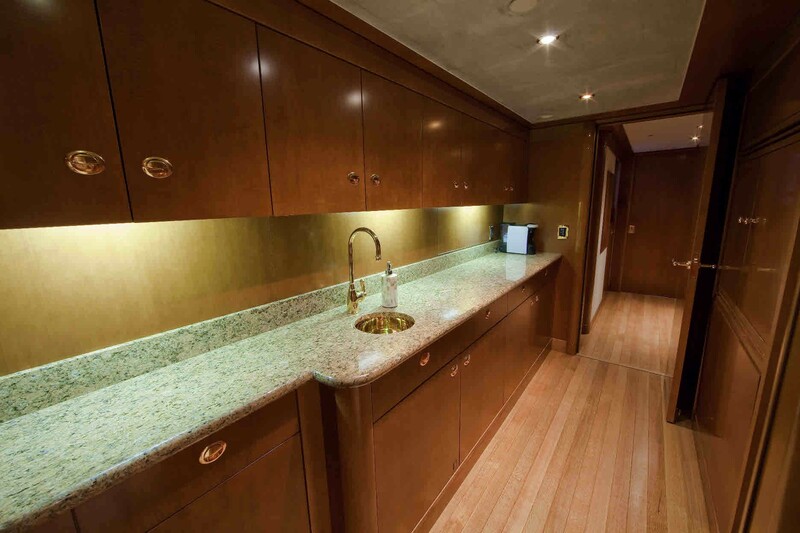 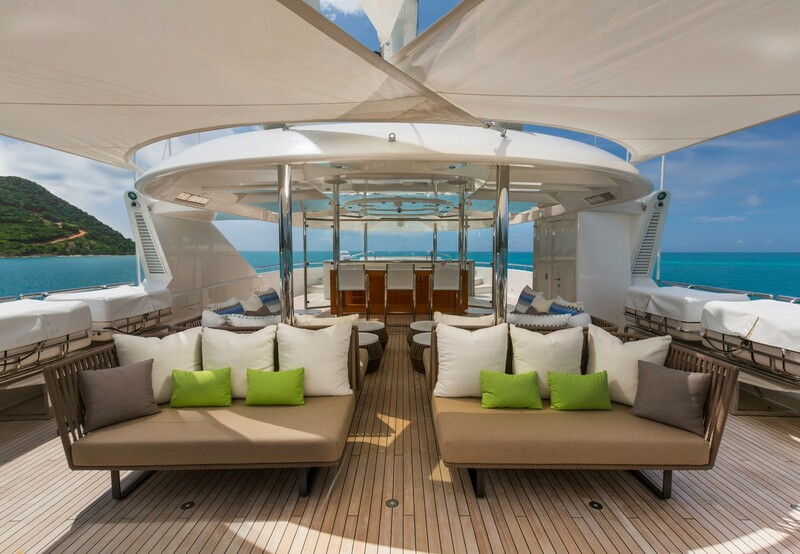 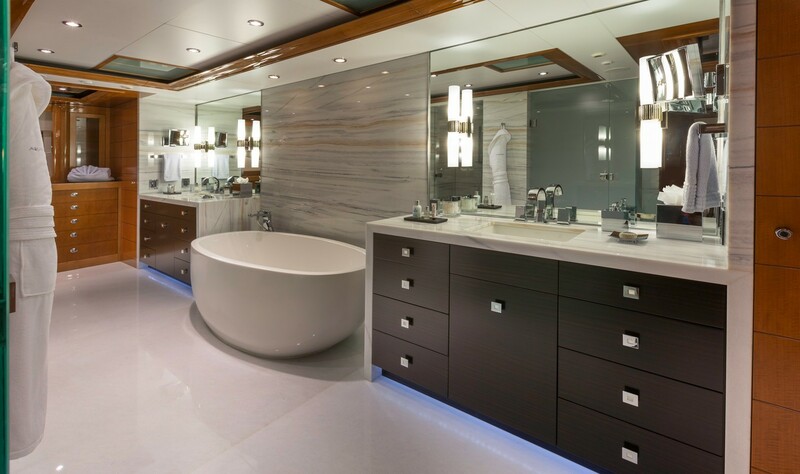 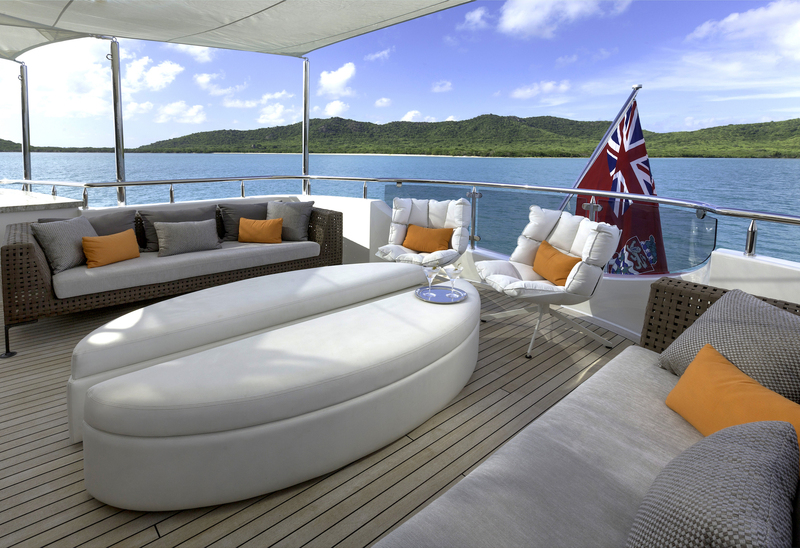 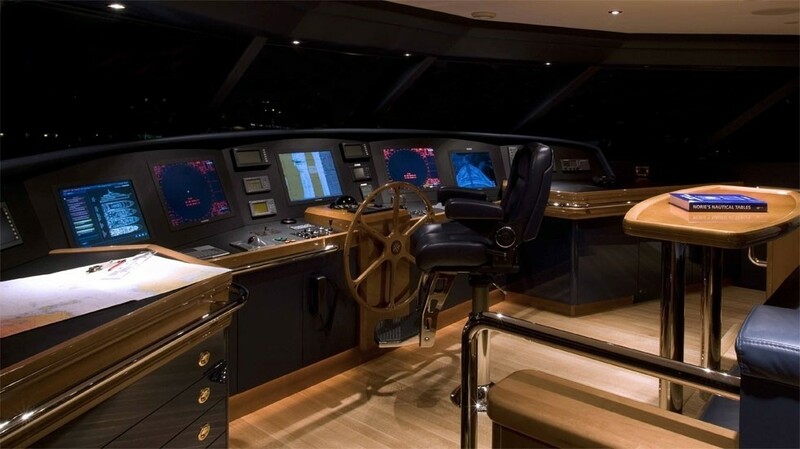 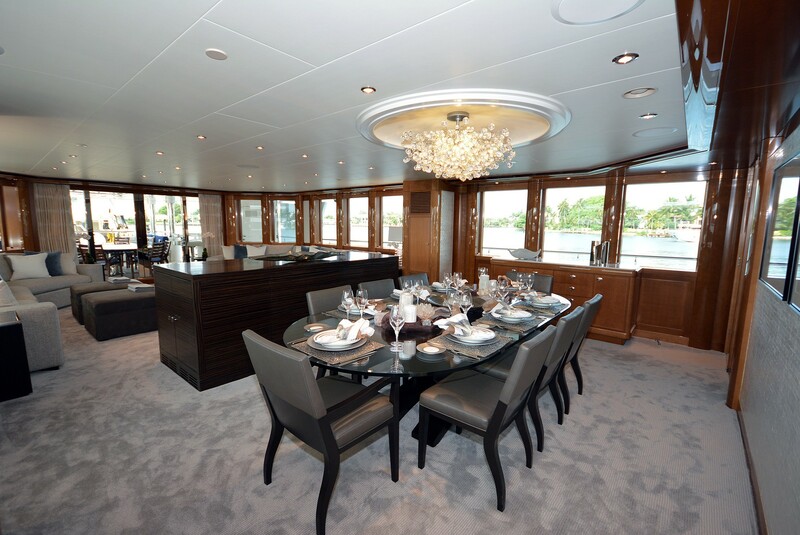 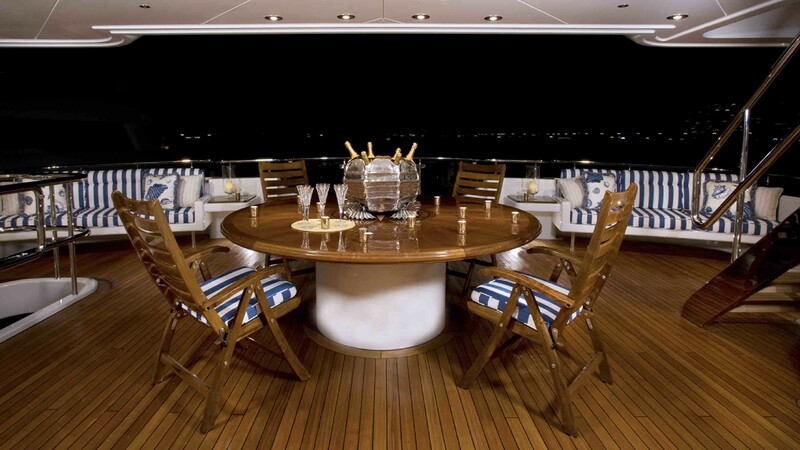 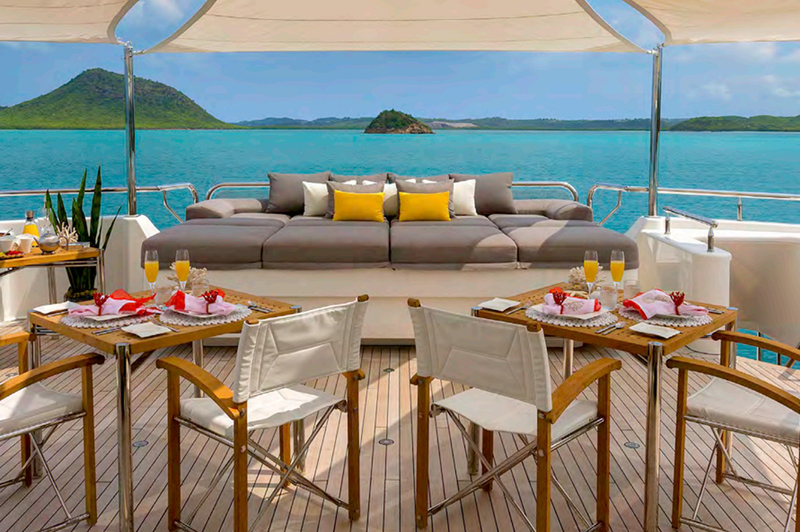 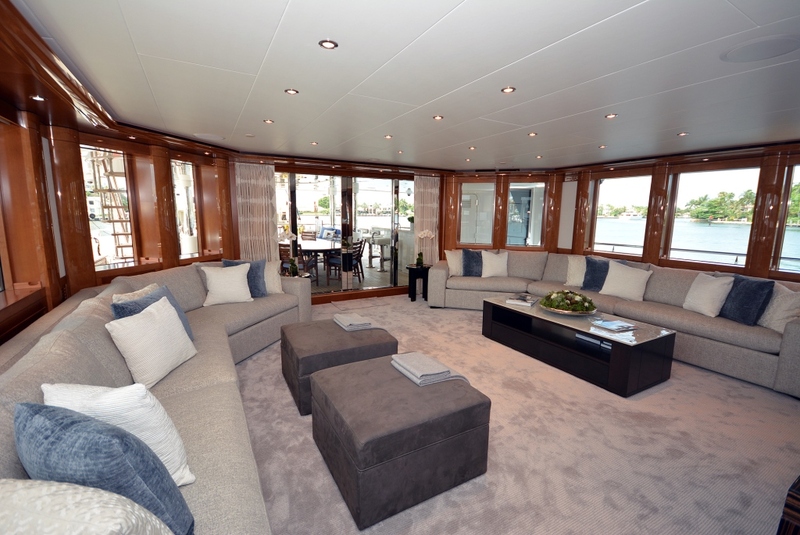 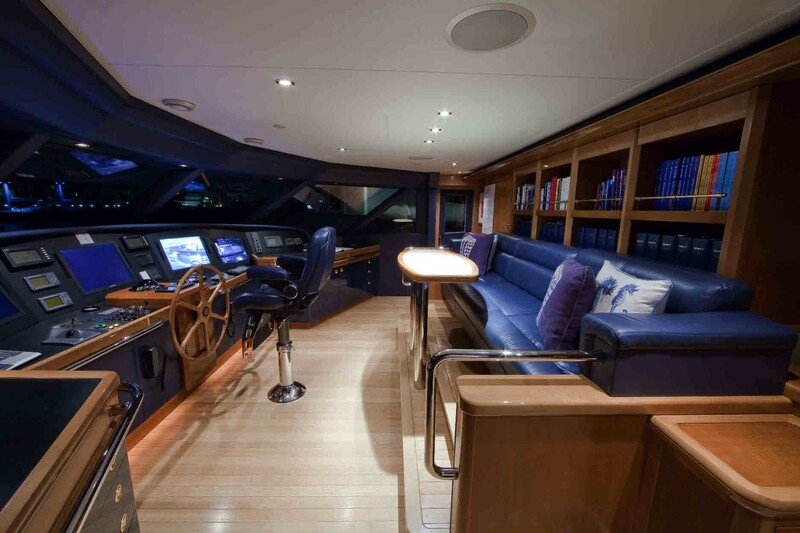 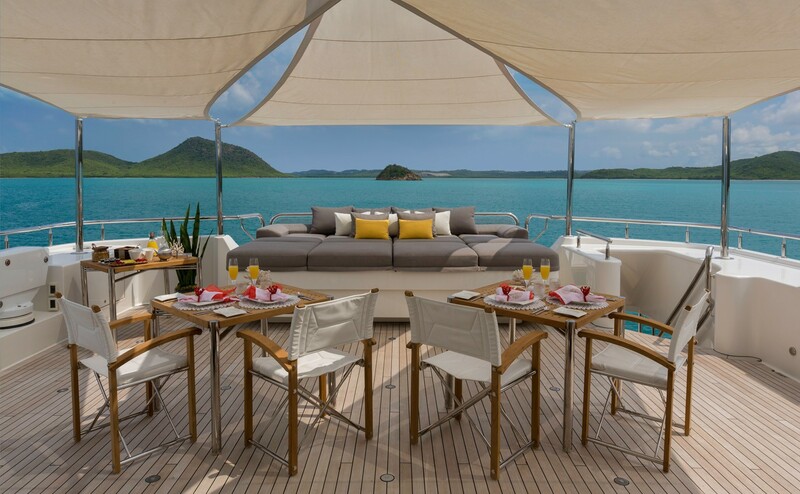 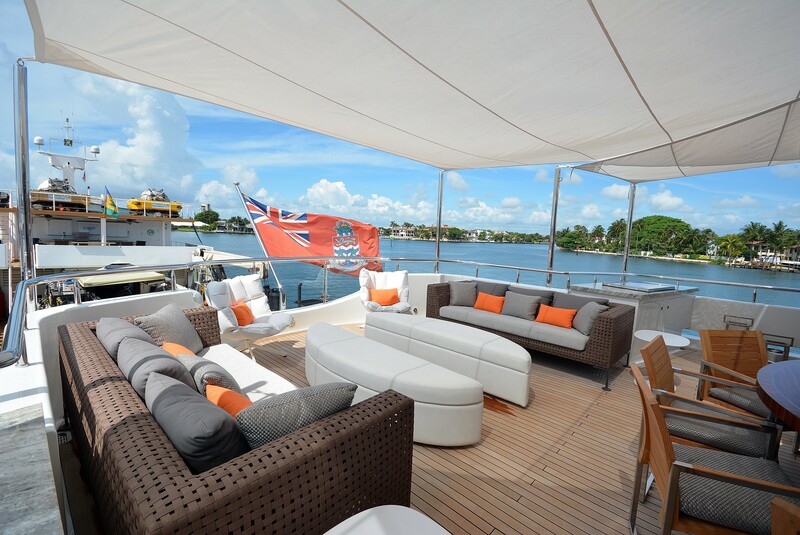 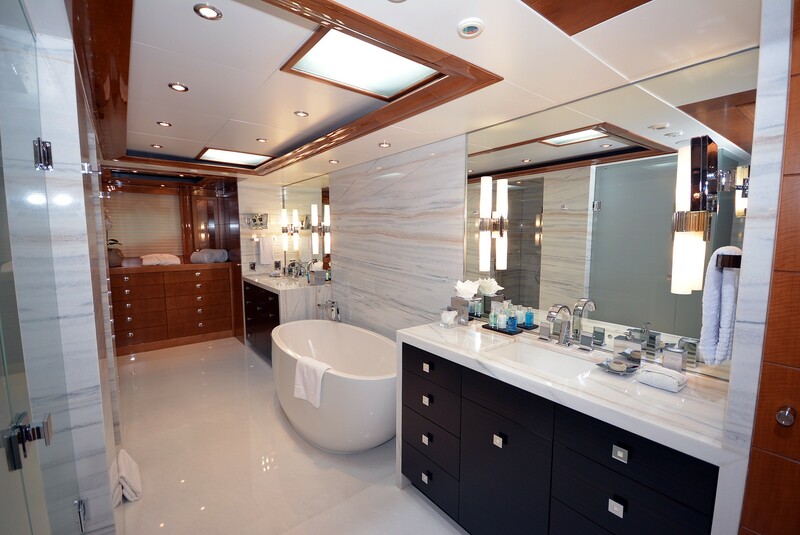 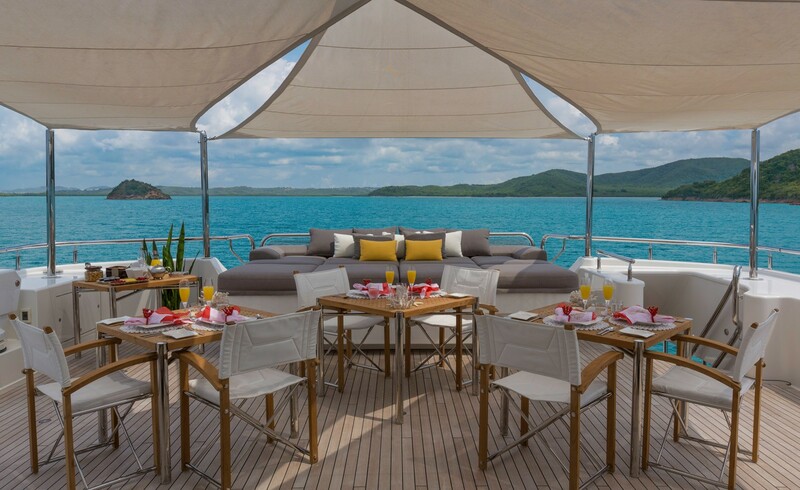 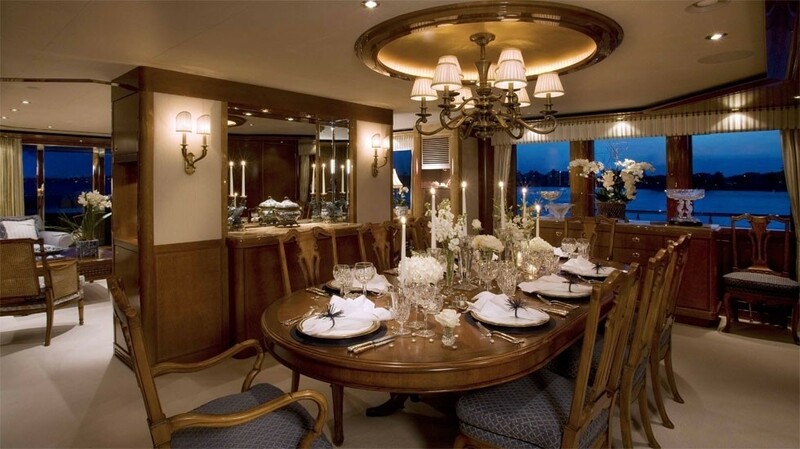 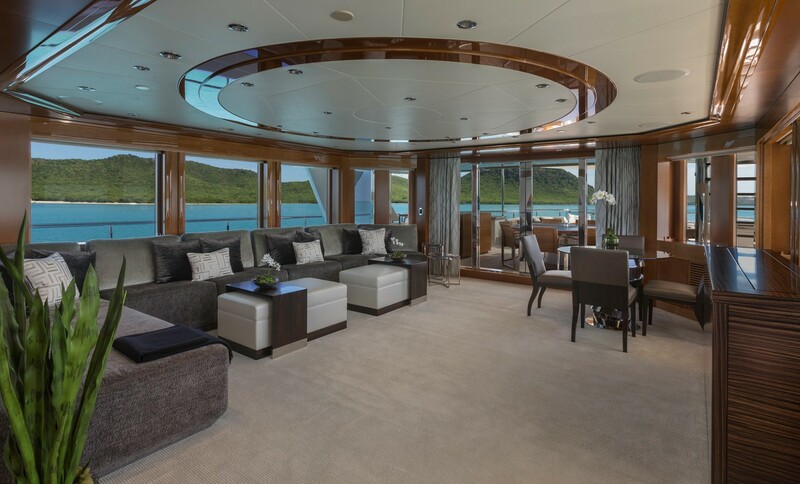 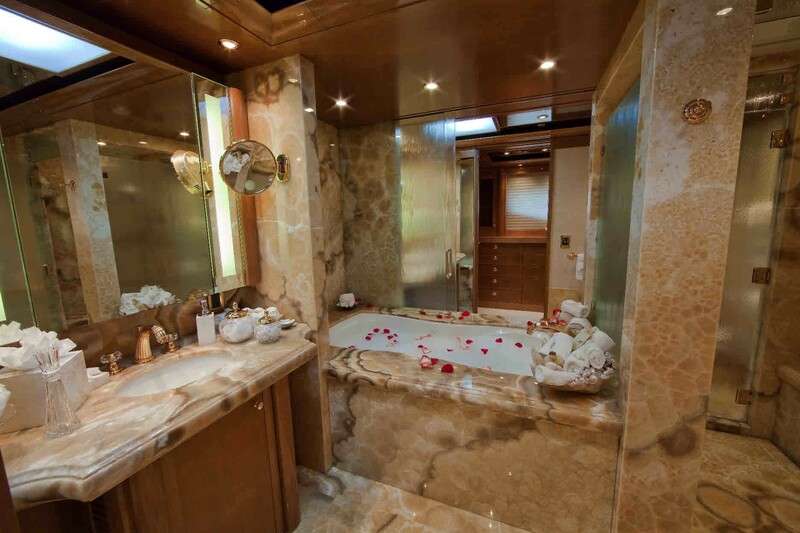 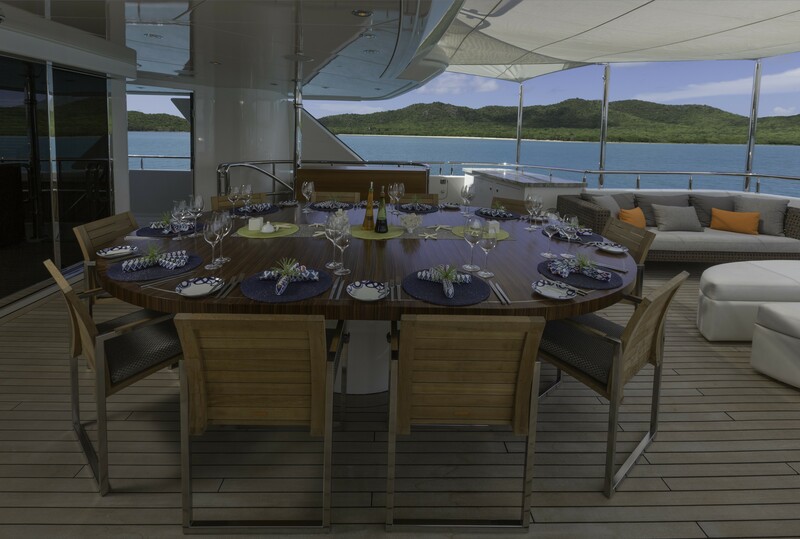 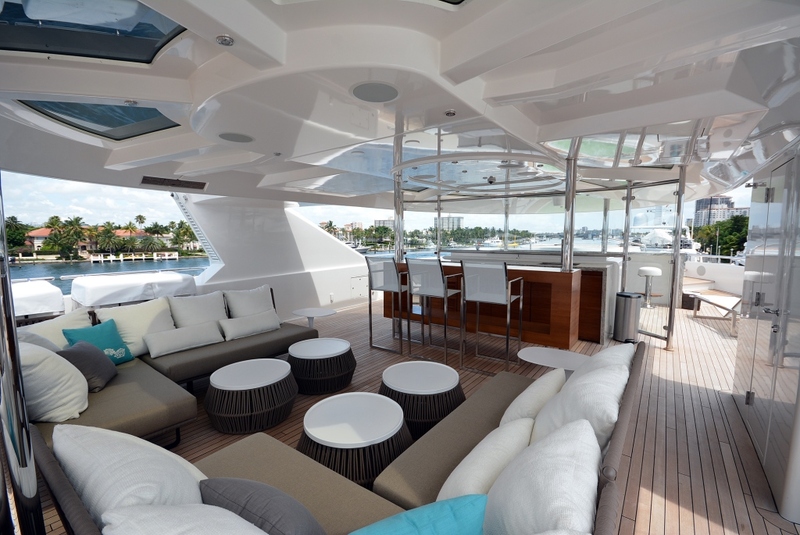 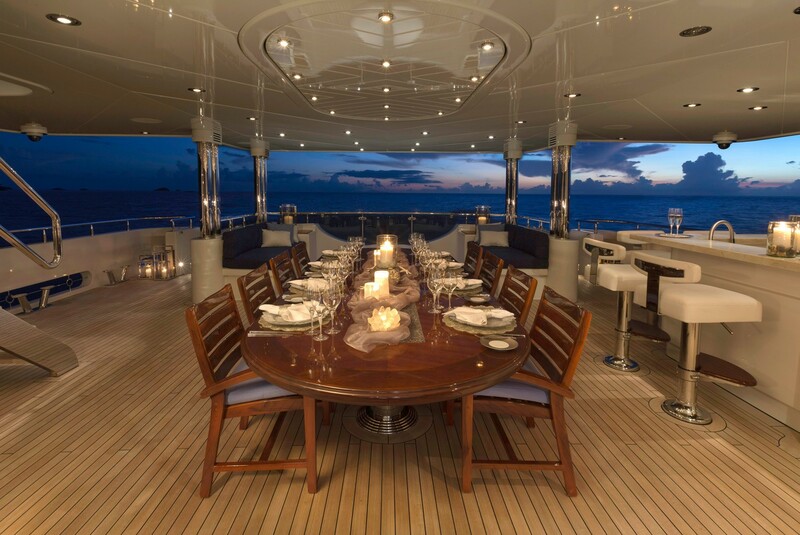 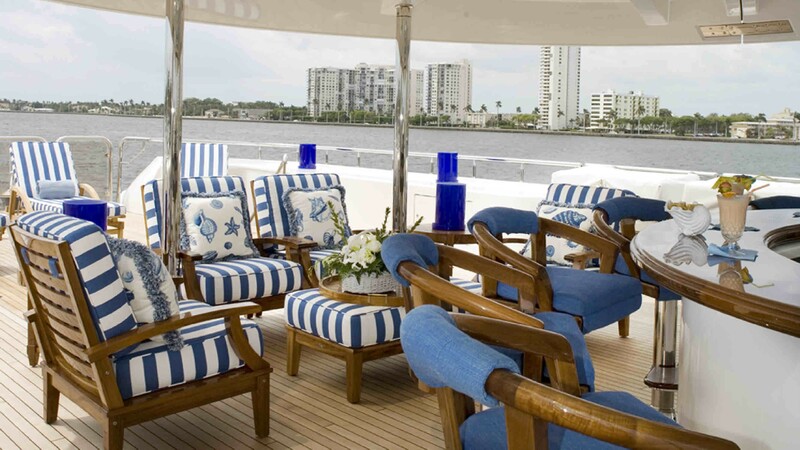 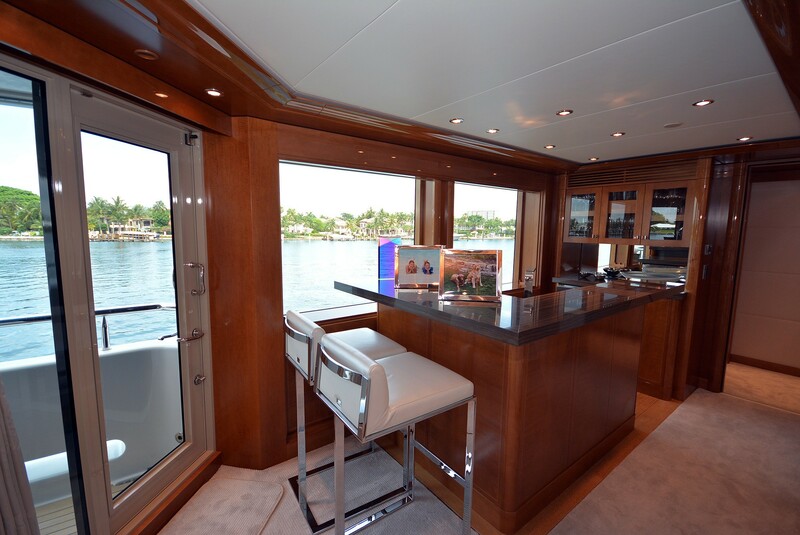 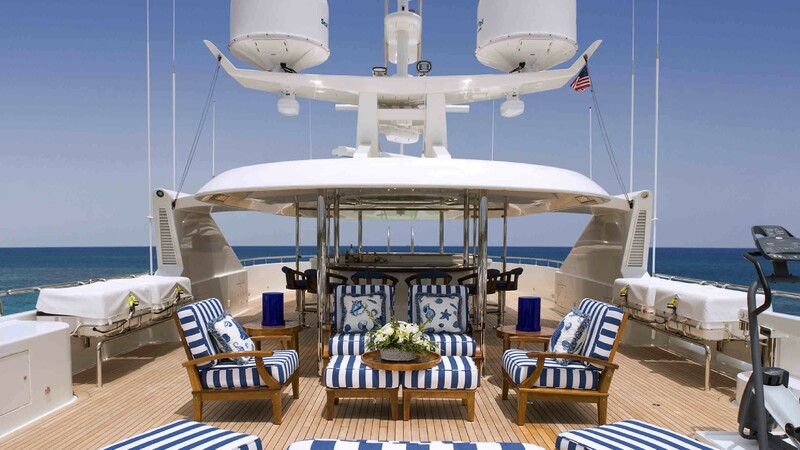 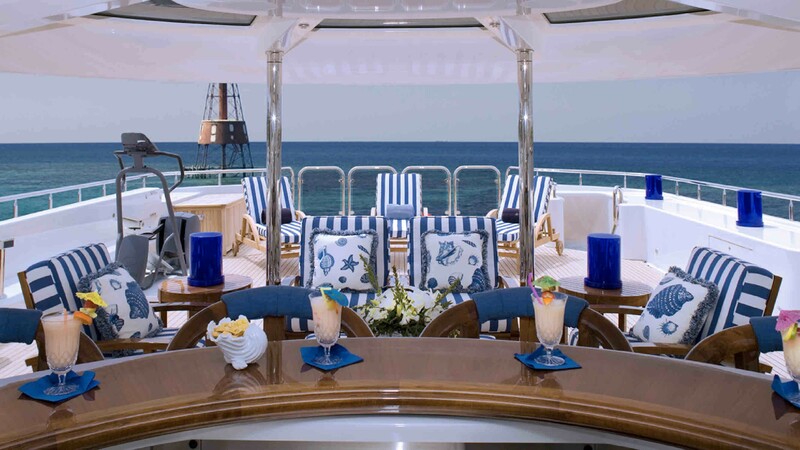 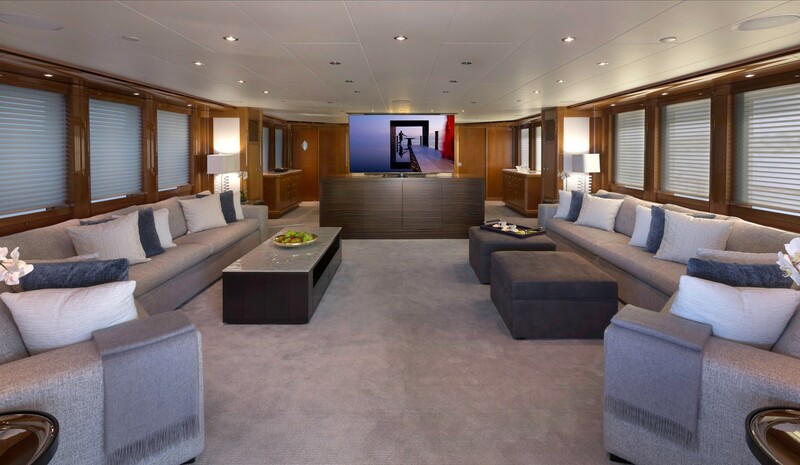 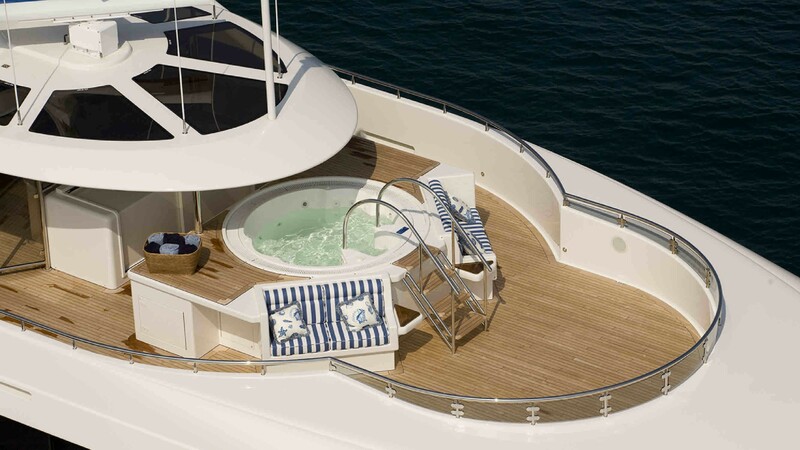 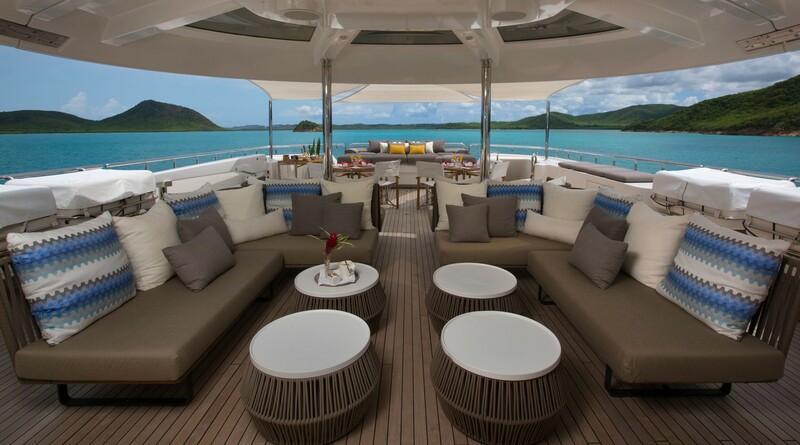 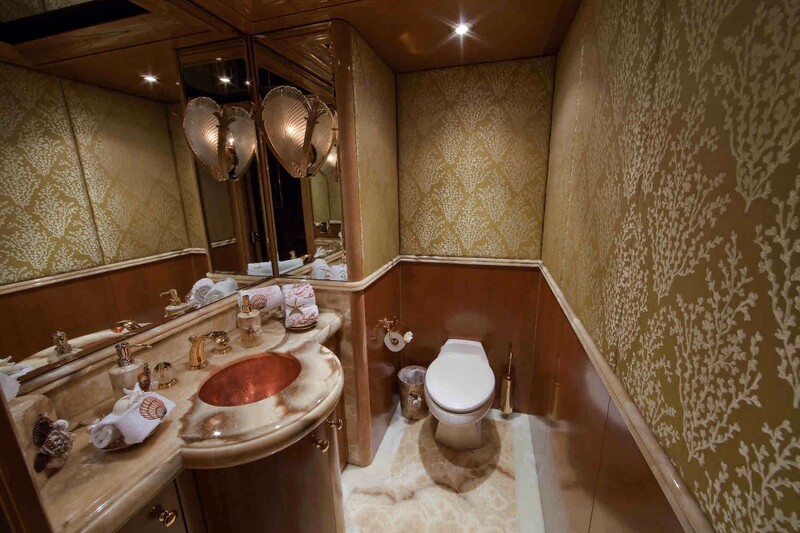 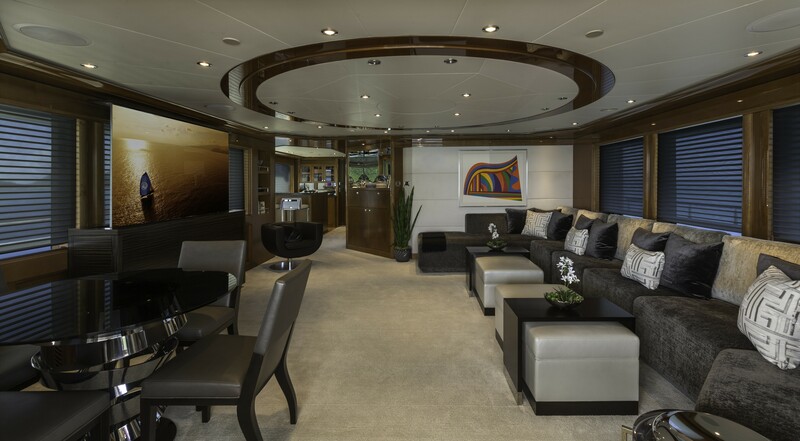 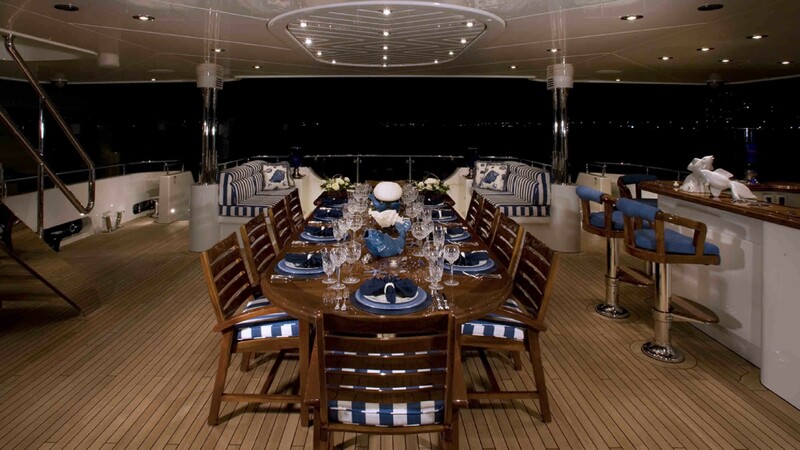 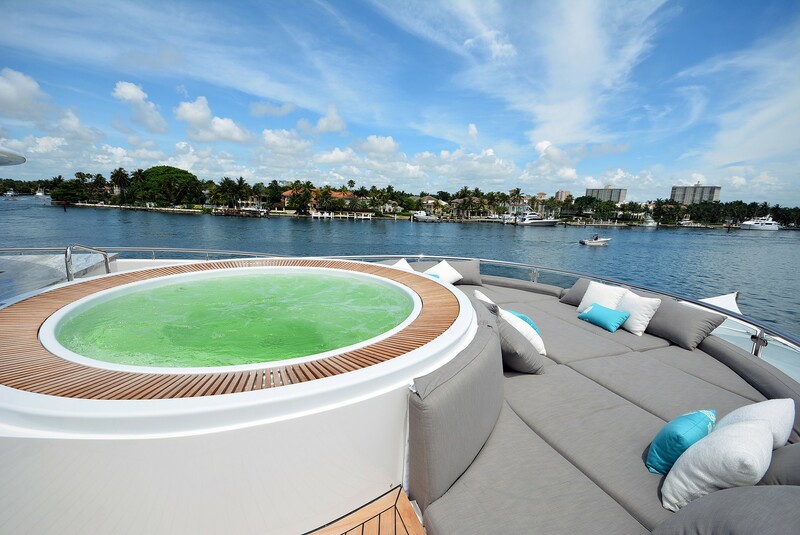 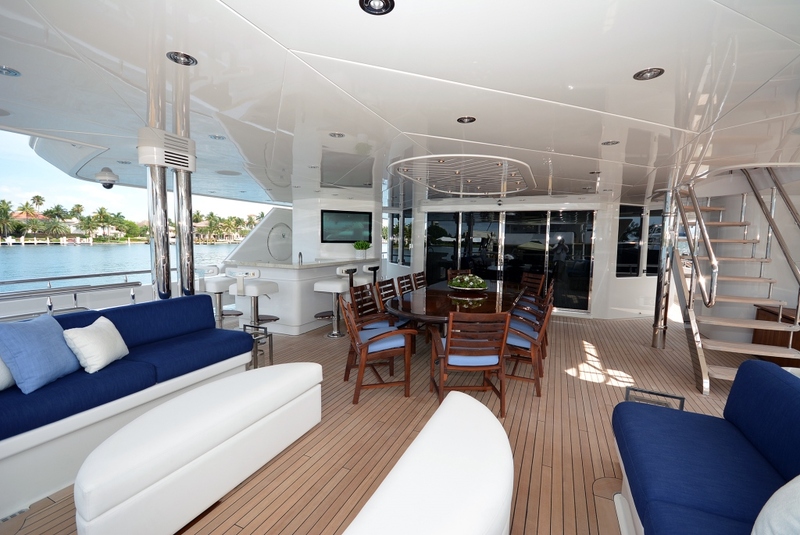 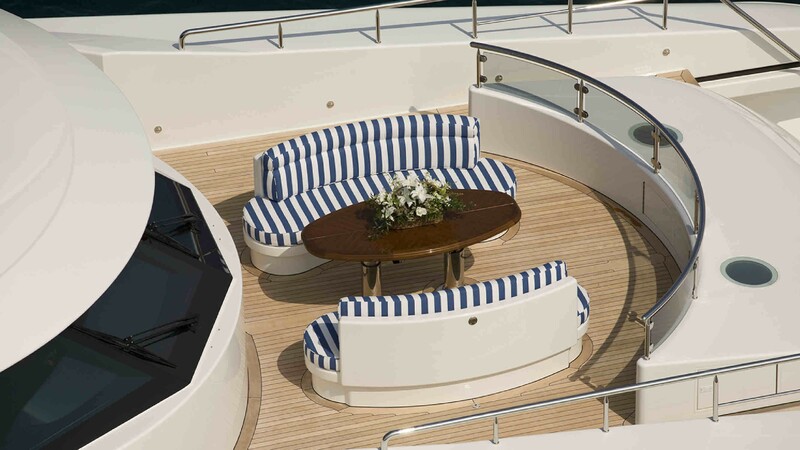 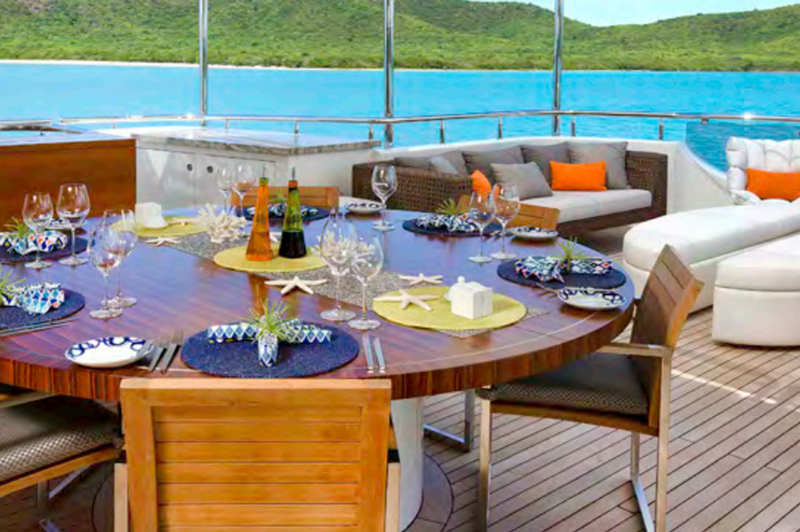 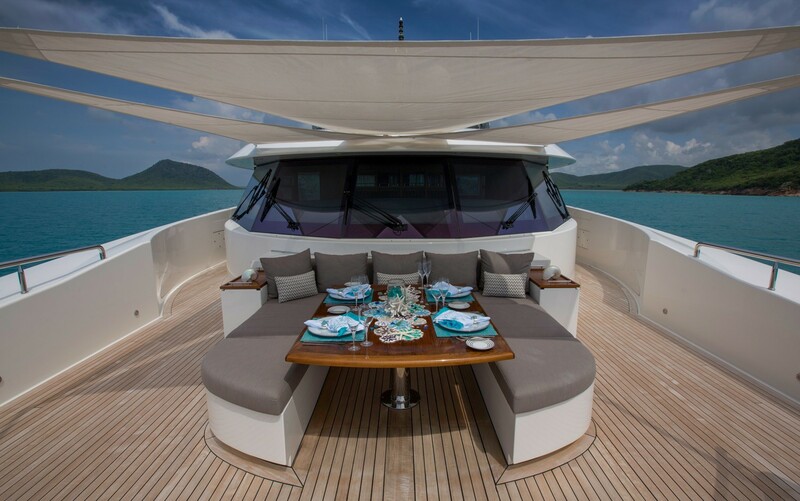 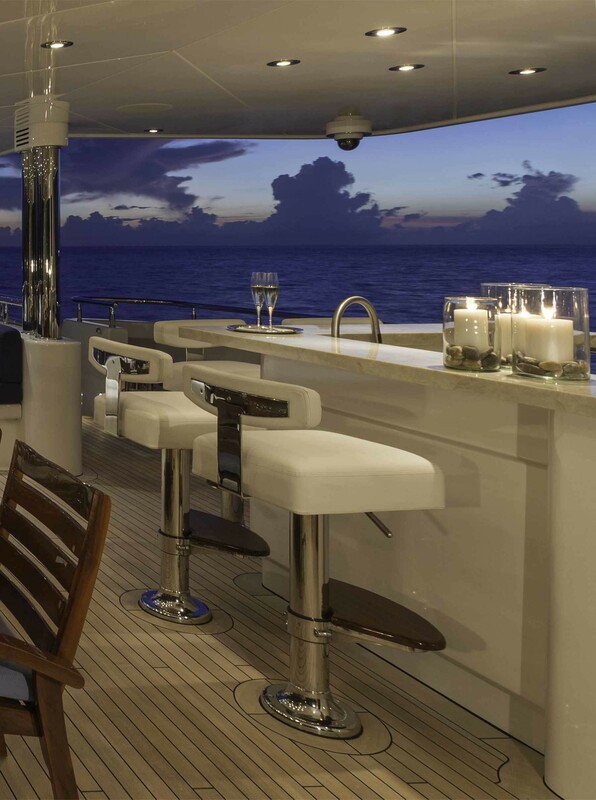 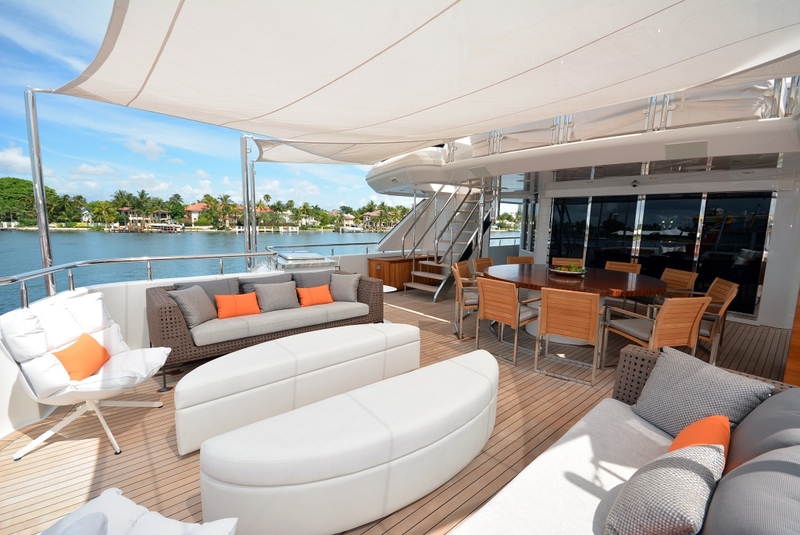 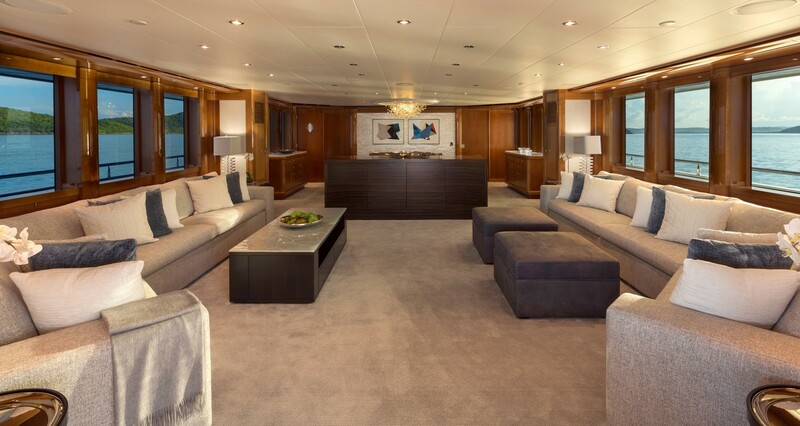 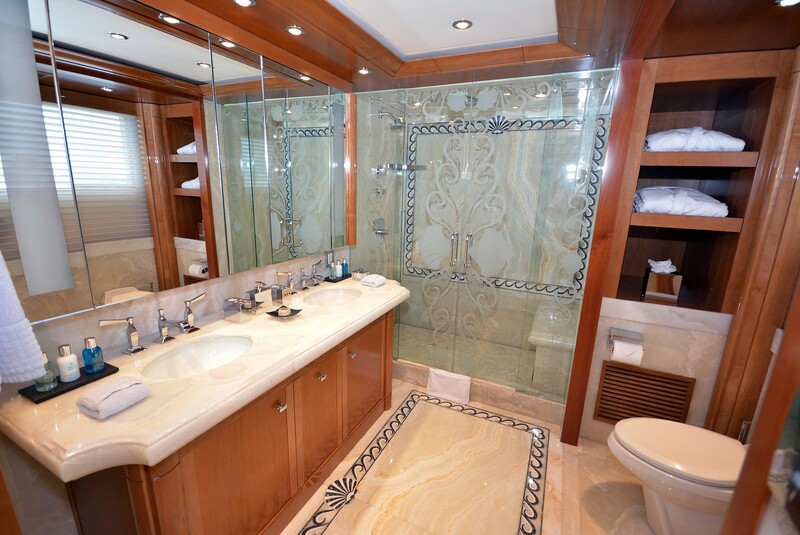 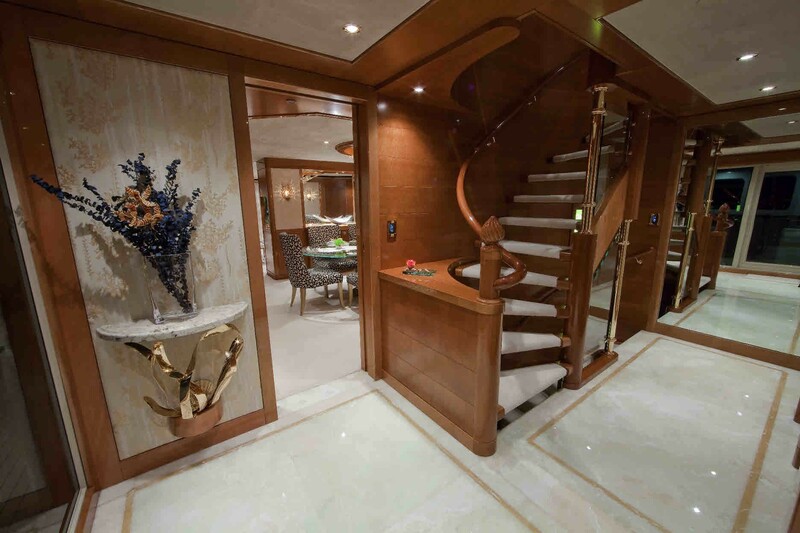 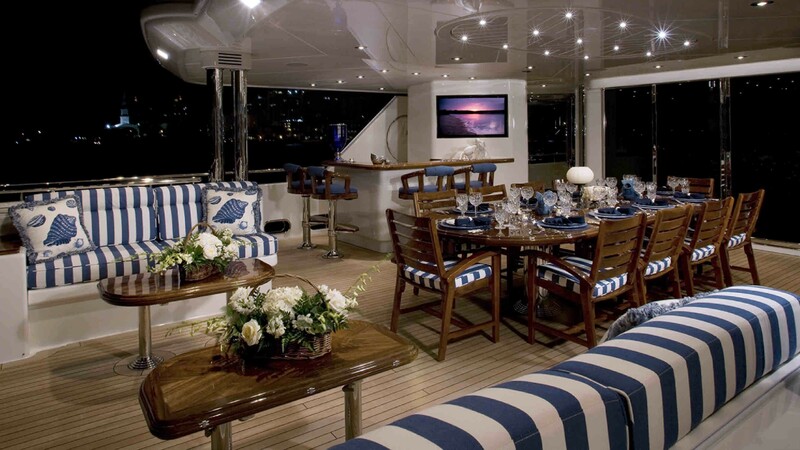 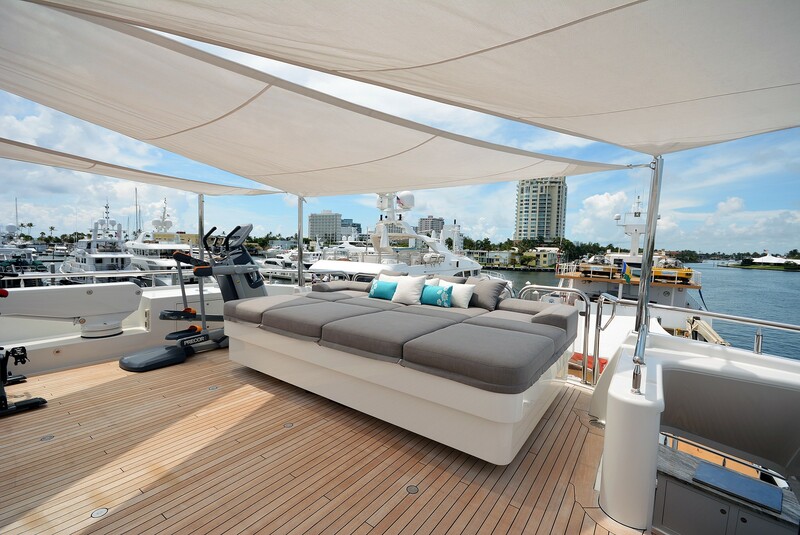 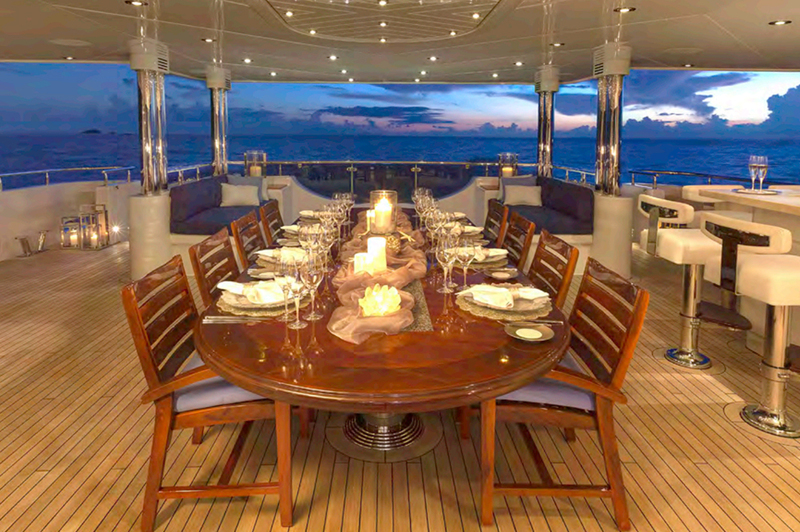 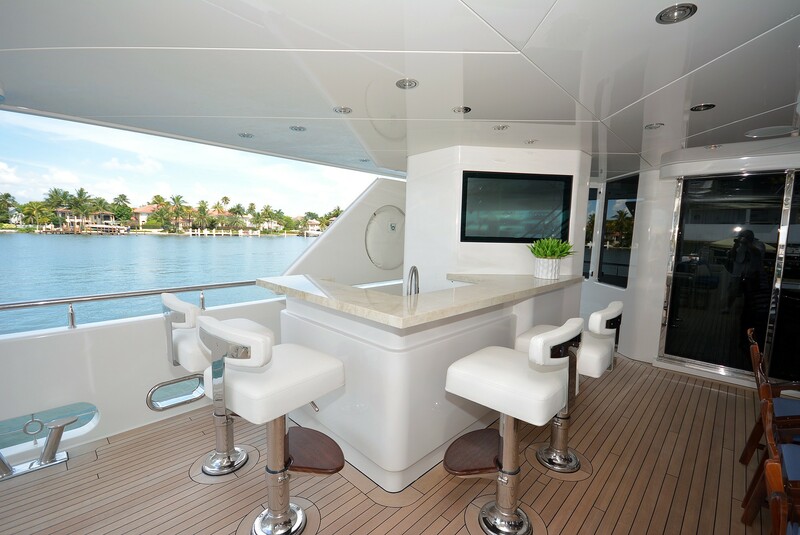 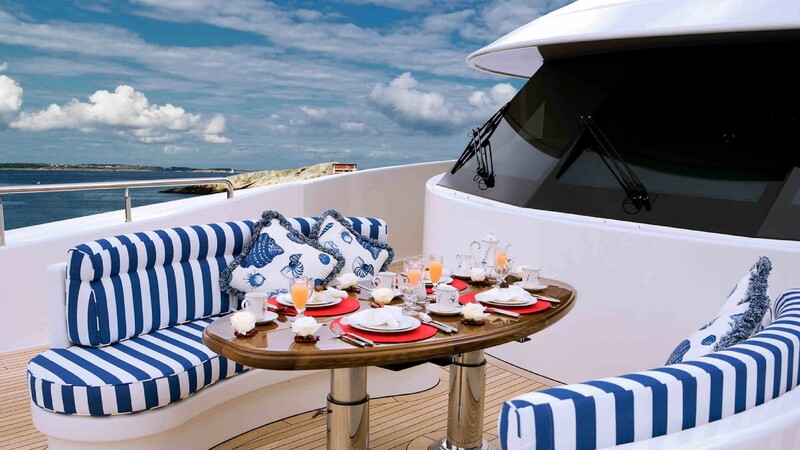 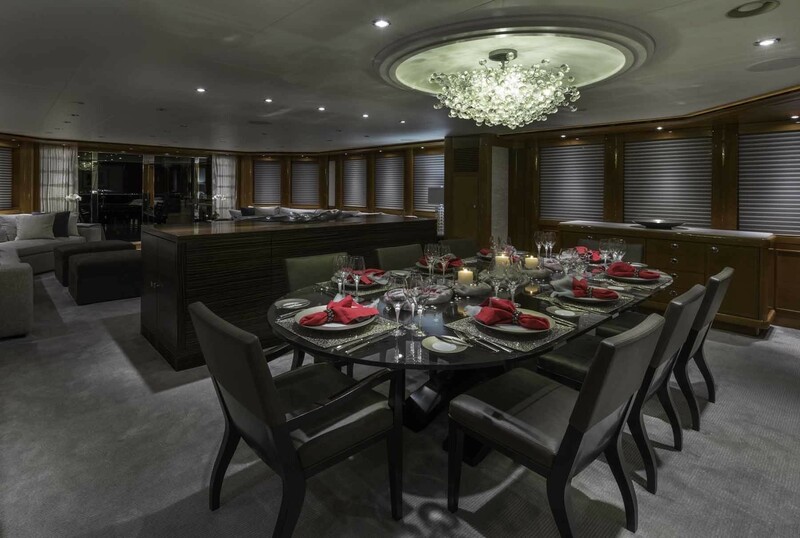 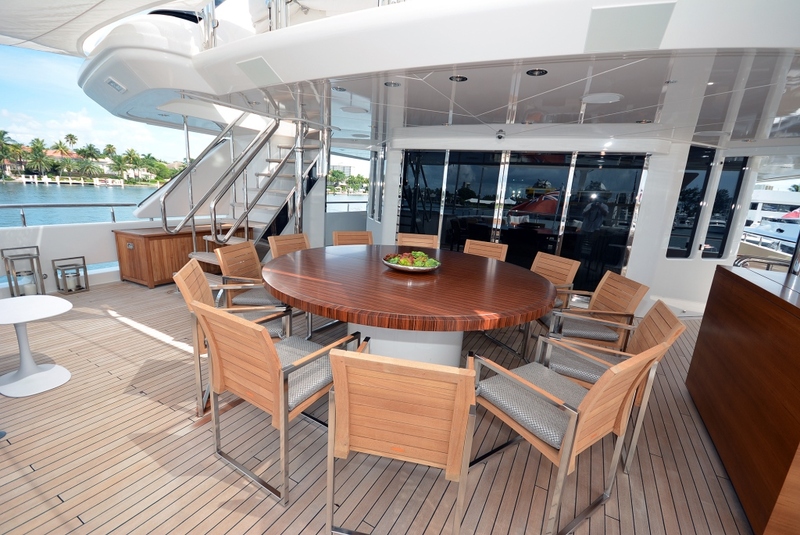 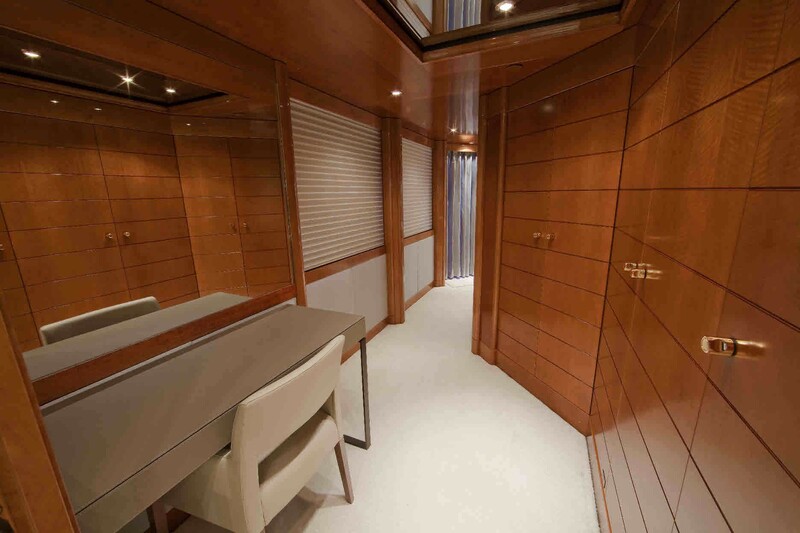 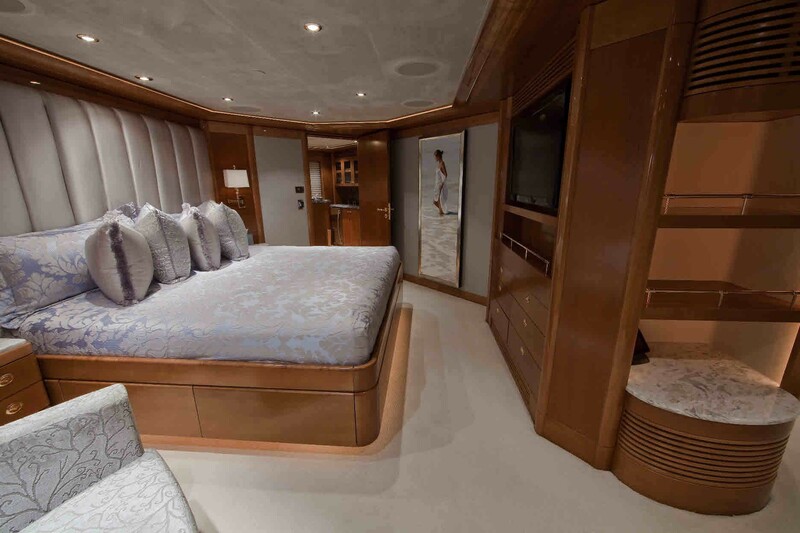 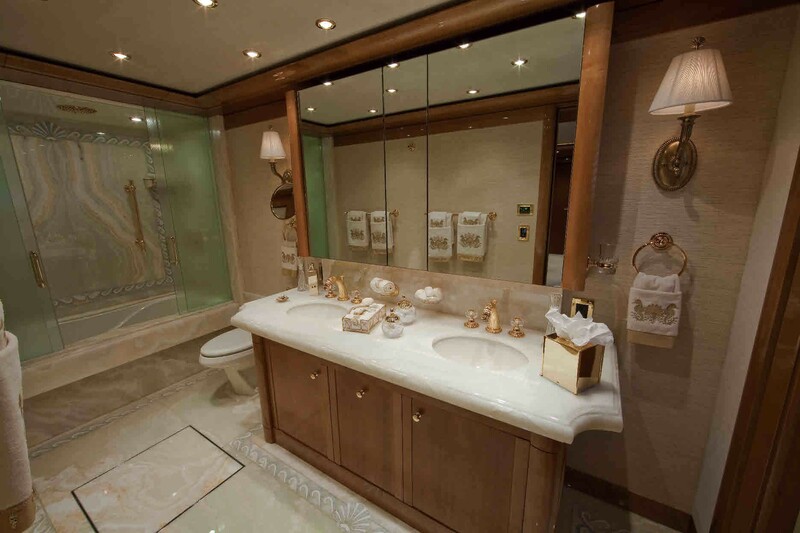 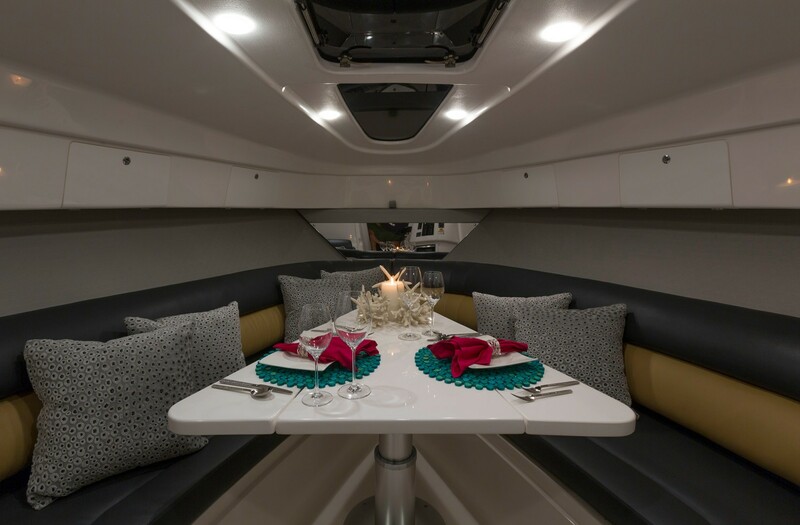 Yacht AQUAVITA boasts a contemporary neutral décor of cool tones and Macassar ebony veneer woods throughout. 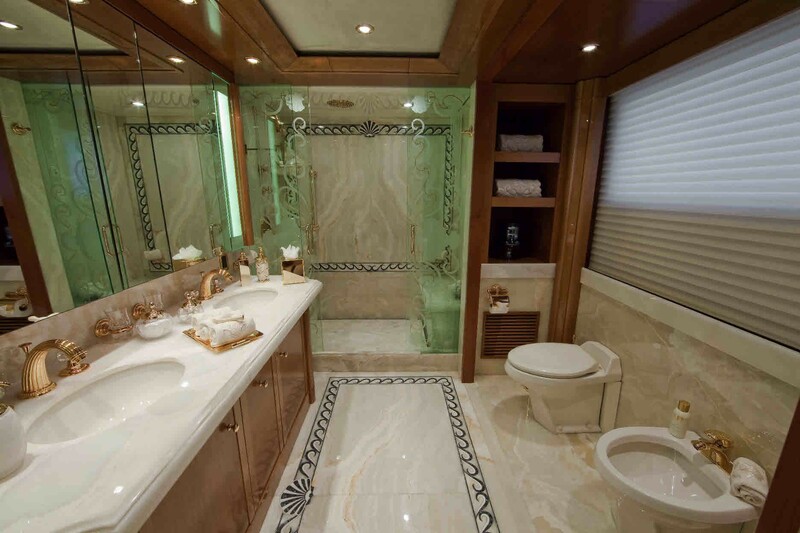 Attention to detail from the marbles to the mother of pearl inlays to designer amenities are evident throughout. 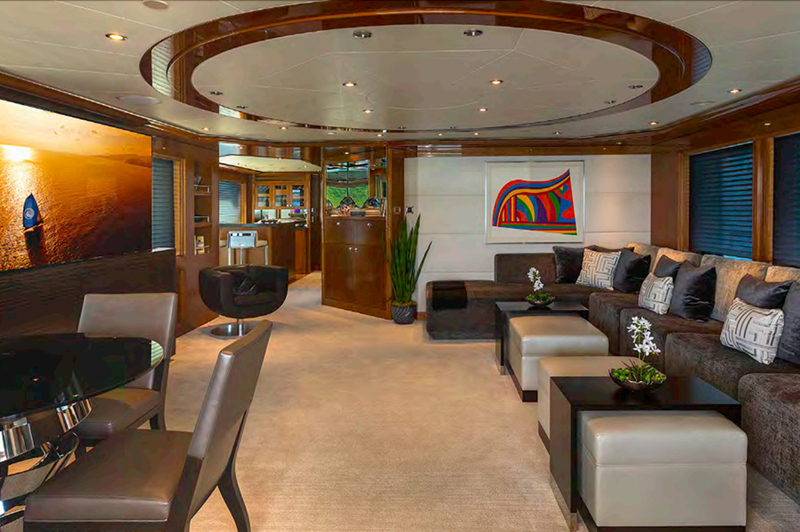 The salon is generous in an open plan, with the lounge aft and formal dining forward. The salon lounge features two large sofas, ottomans and coffee table. 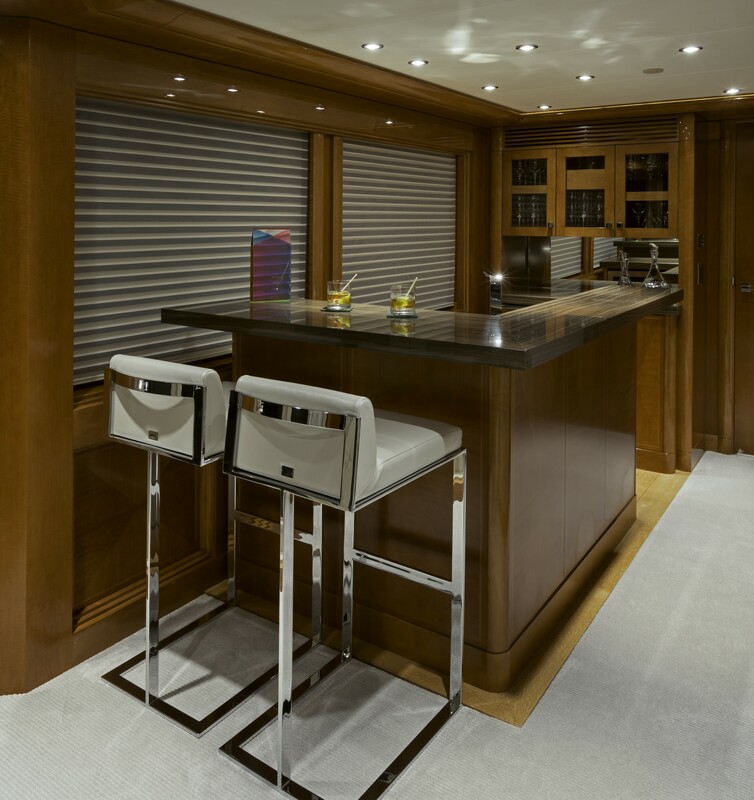 A low island Credenza with 360° swiveling retractable TV, gives a casual separation to the formal dining forward. 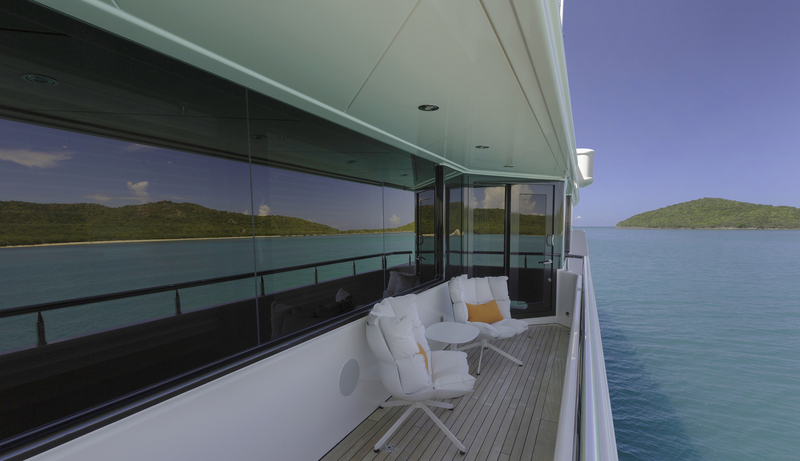 Panoramic windows ensure ample natural light while providing optimum viewing. 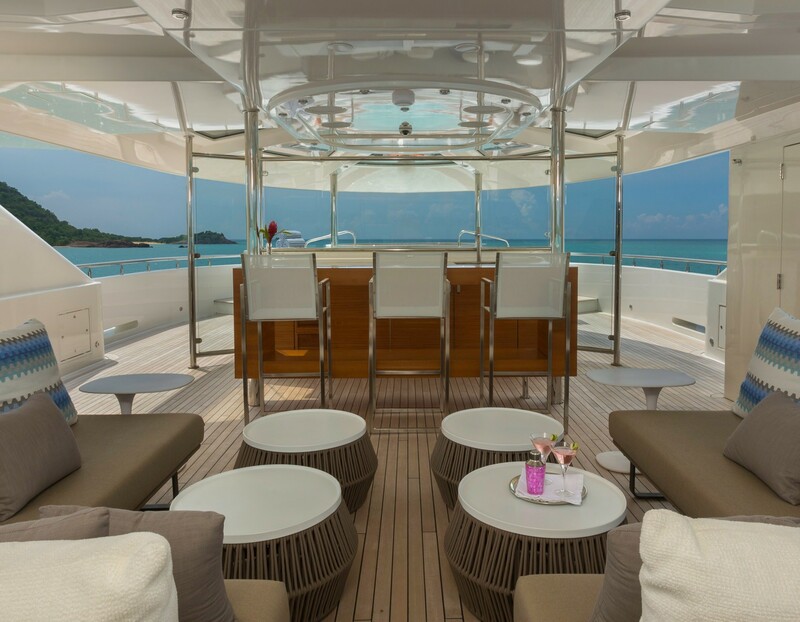 An upper sky lounge is perfect for formal or casual occasions and boasts plenty of seating, entertainment, and complete wet bar. 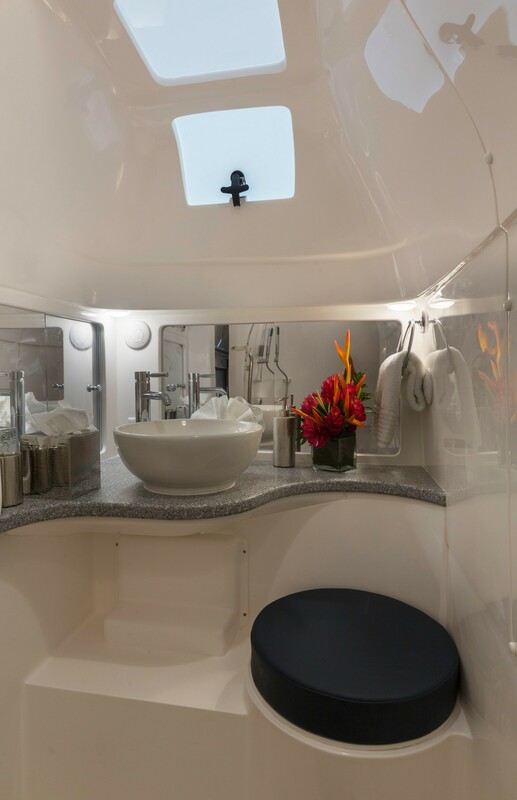 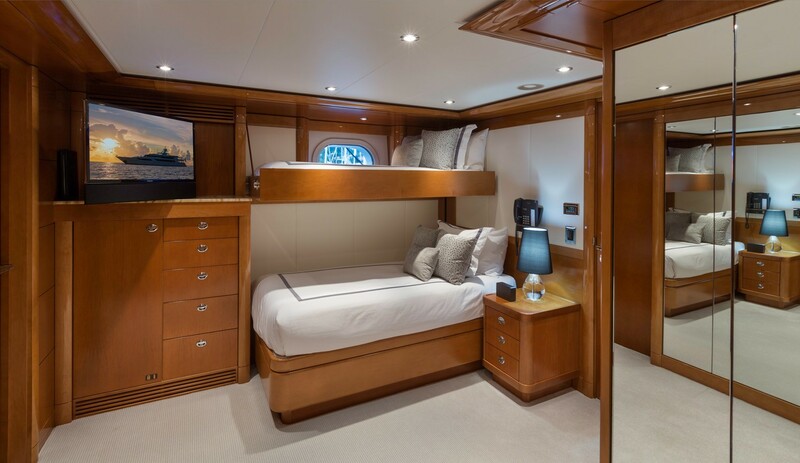 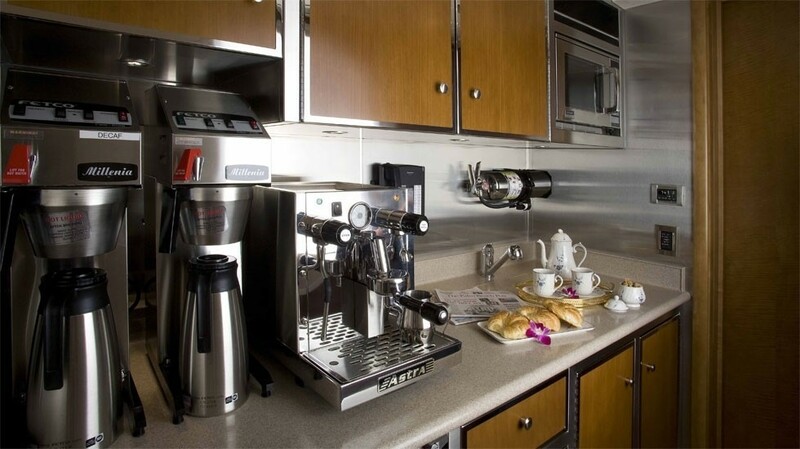 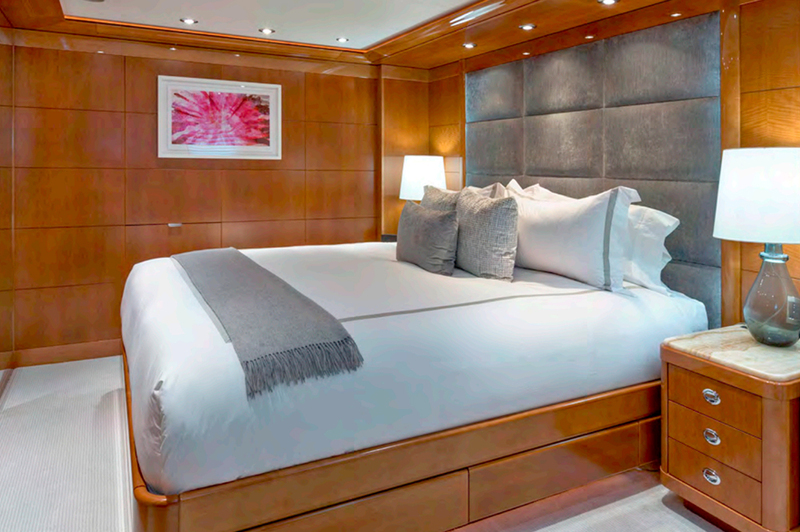 Guest accommodation is in a master cabin on the main deck, a VIP cabin on the bridge deck, and a further four cabins below decks, all with en-suite facilities. 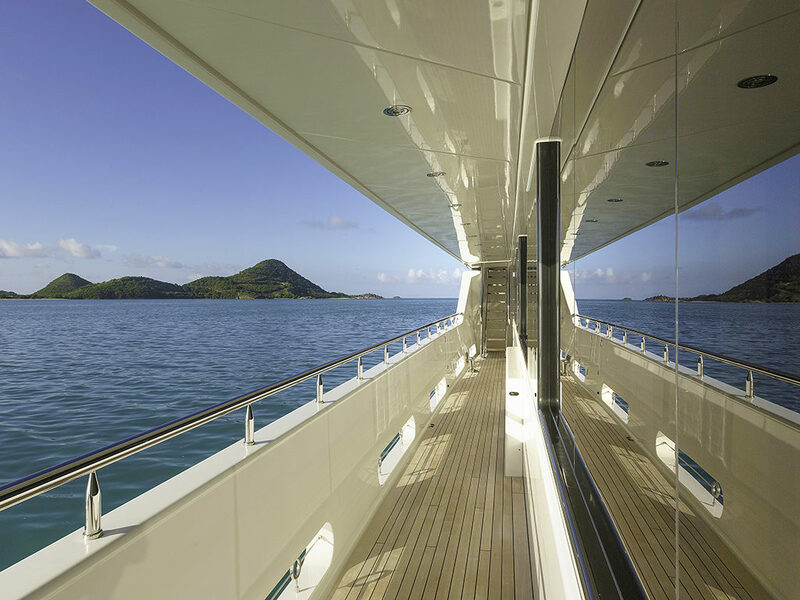 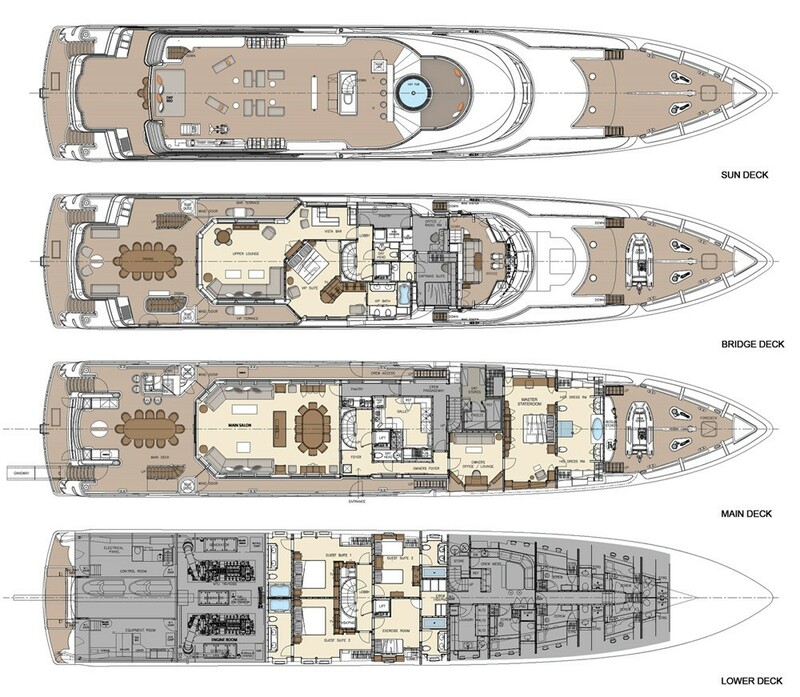 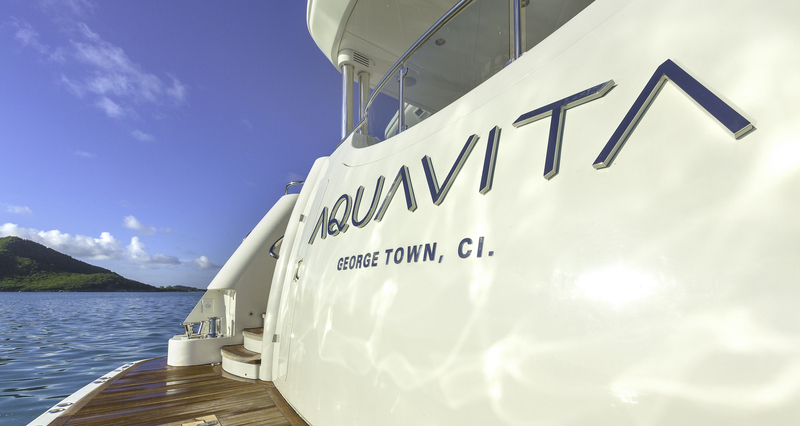 Thanks to an internal elevator, AQUAVITA’s decks can be easily reached, from the guest’s cabins below decks to the sky lounge above. 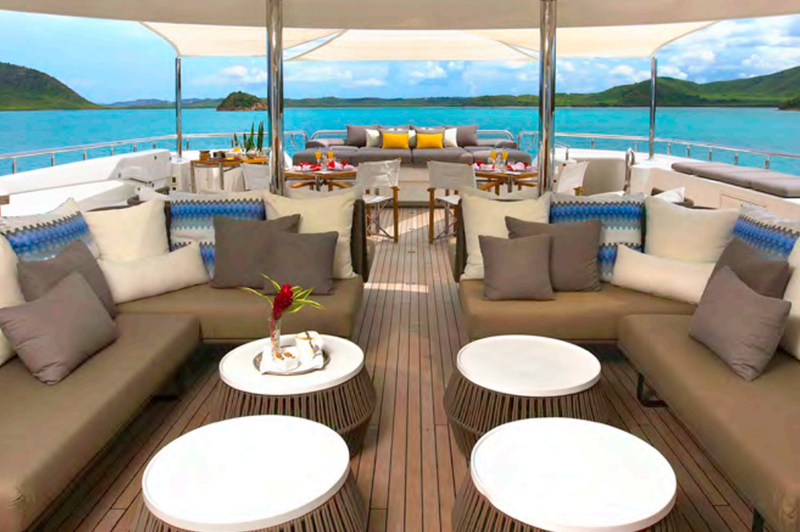 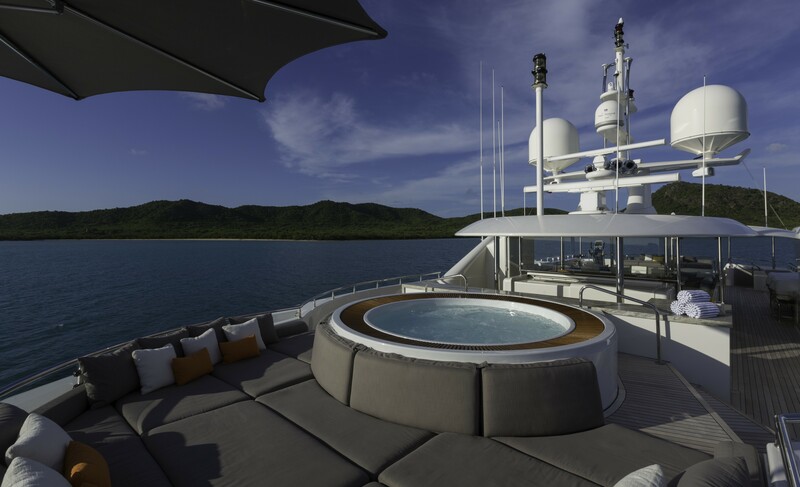 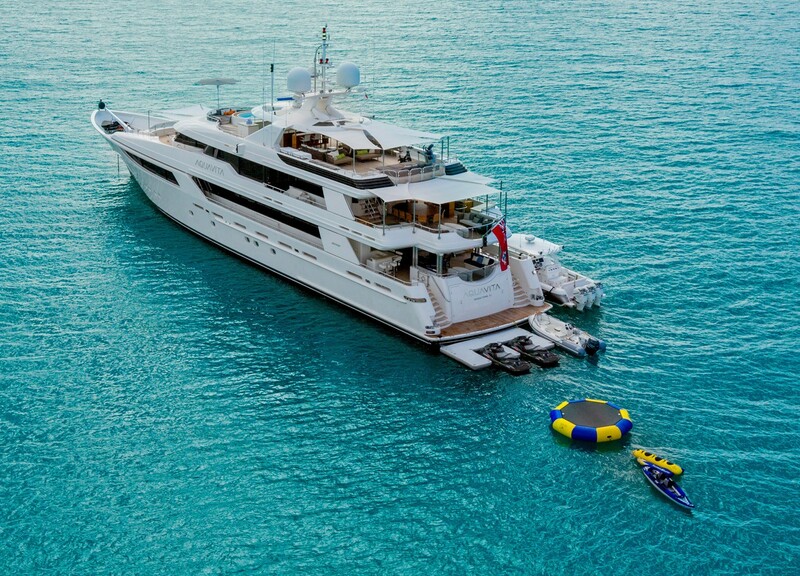 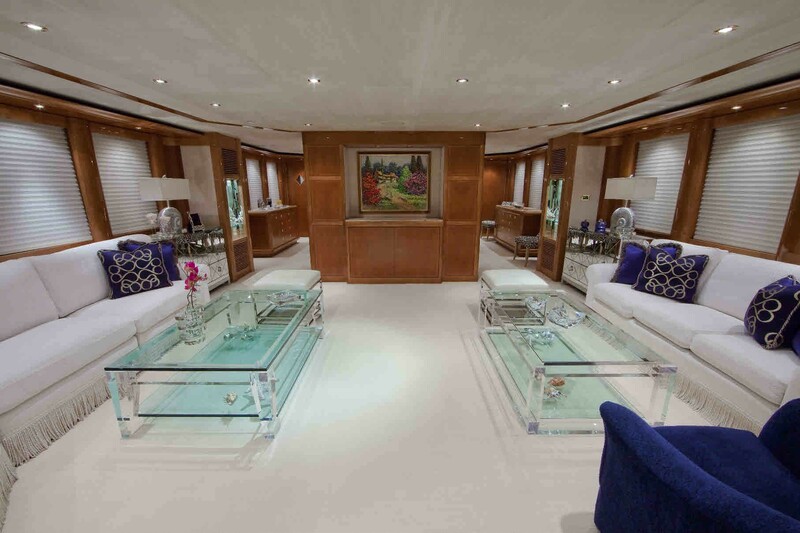 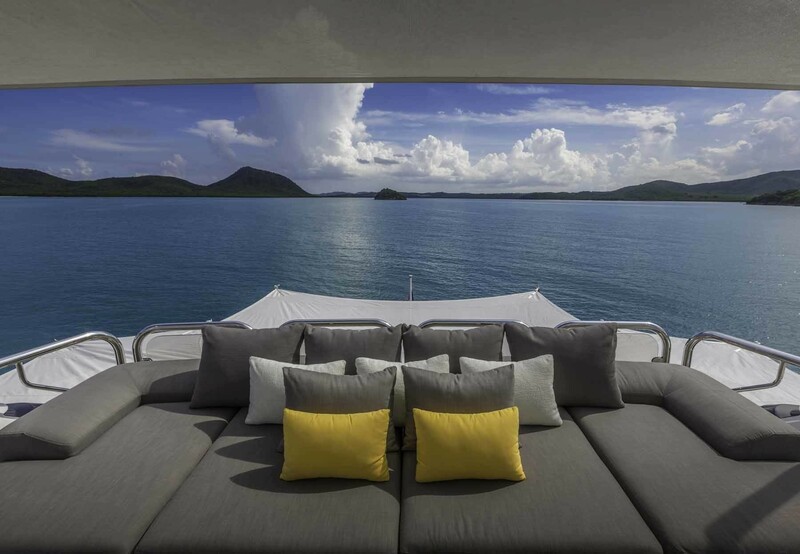 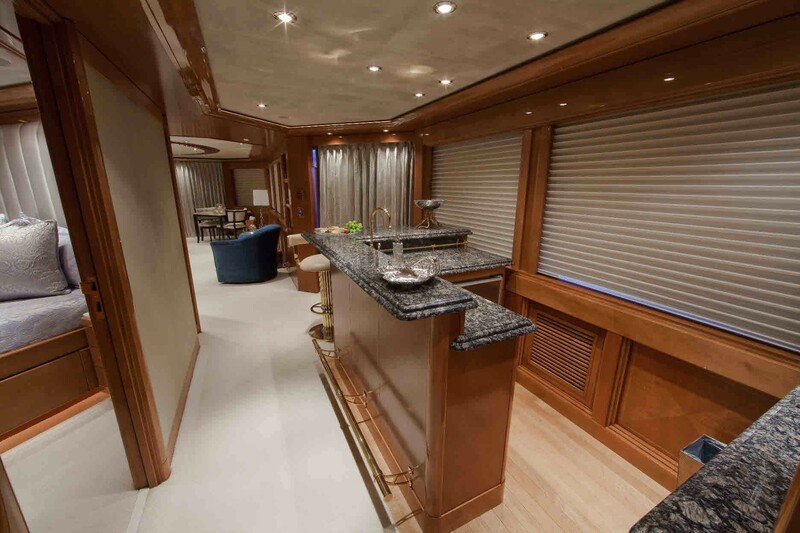 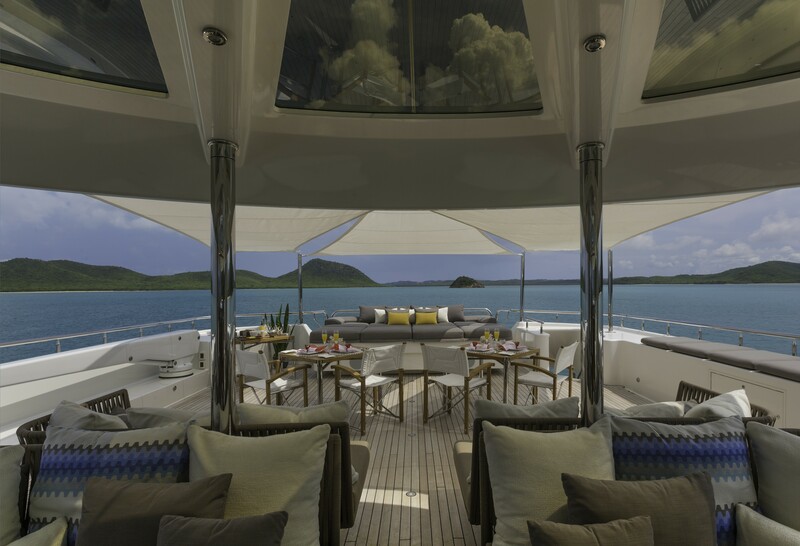 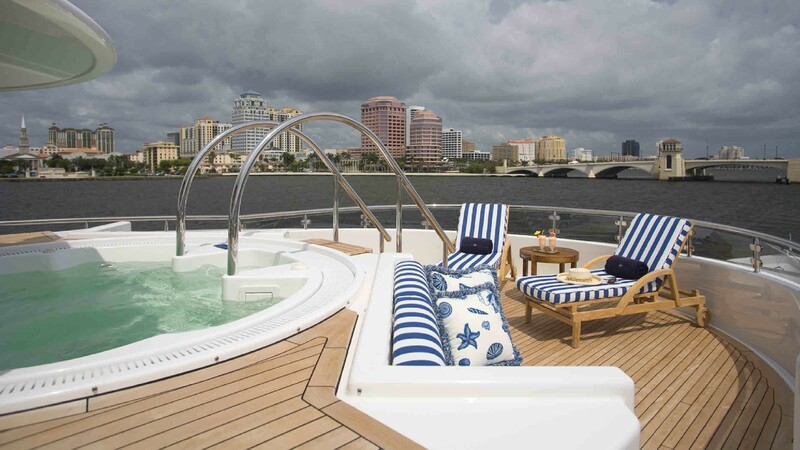 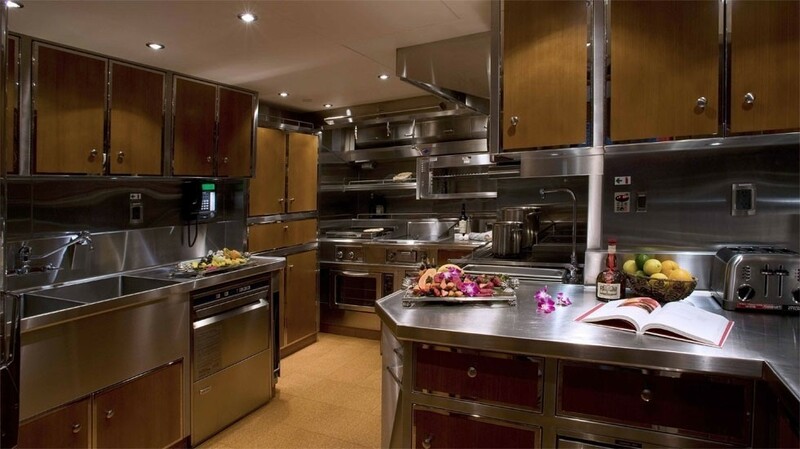 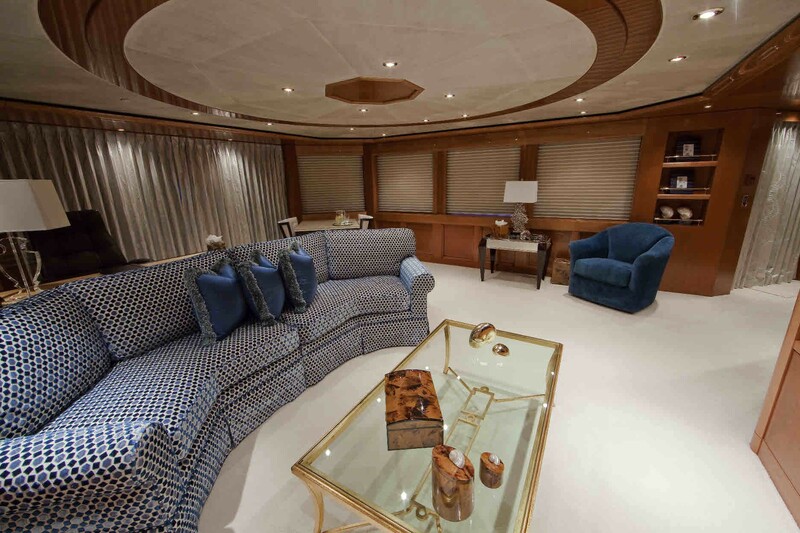 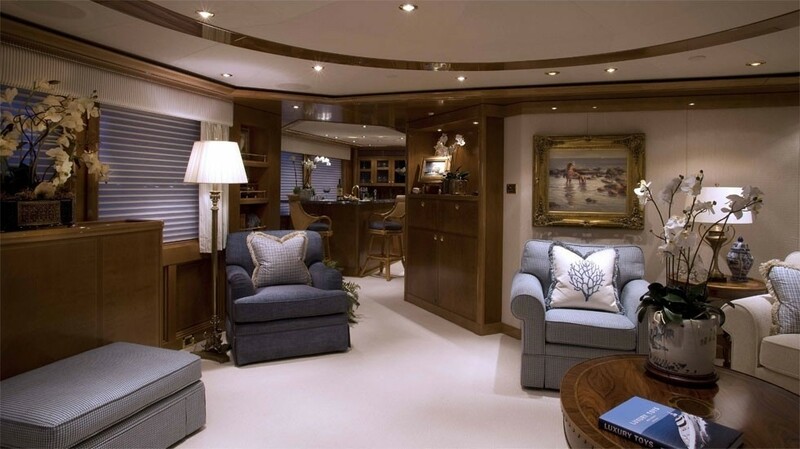 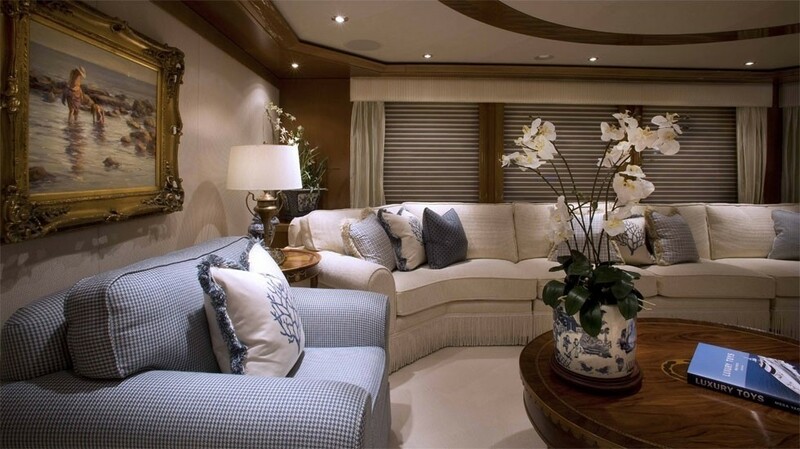 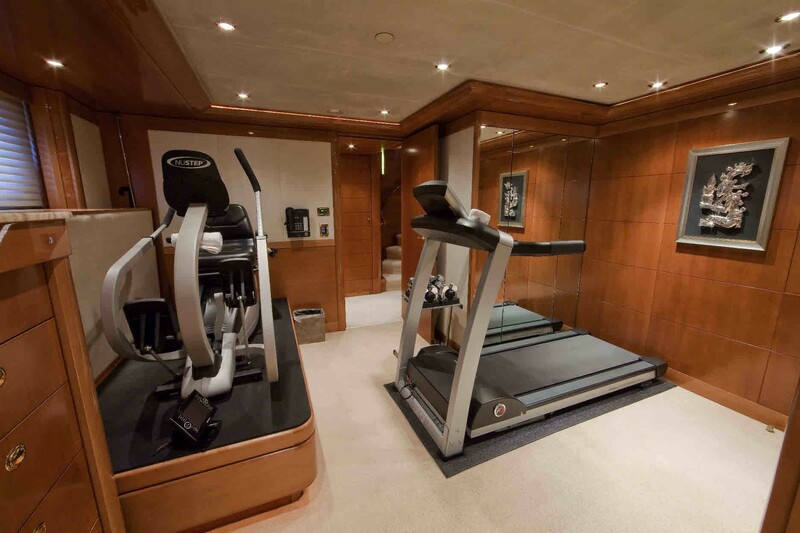 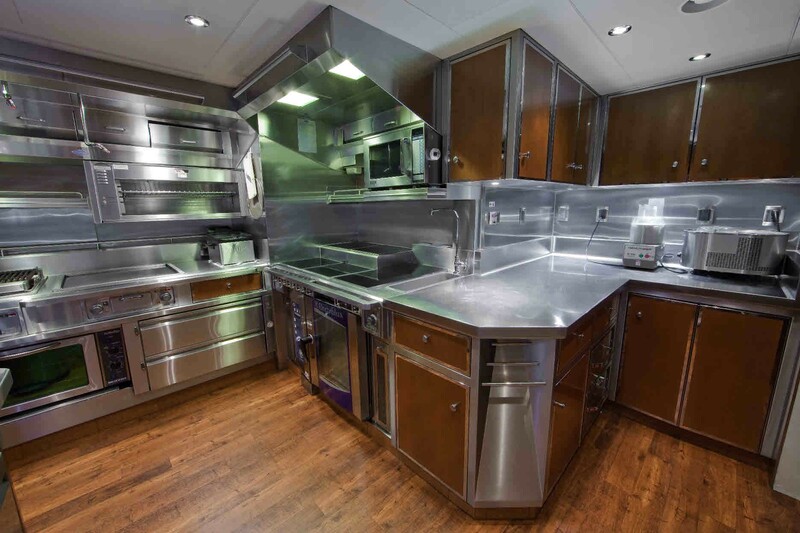 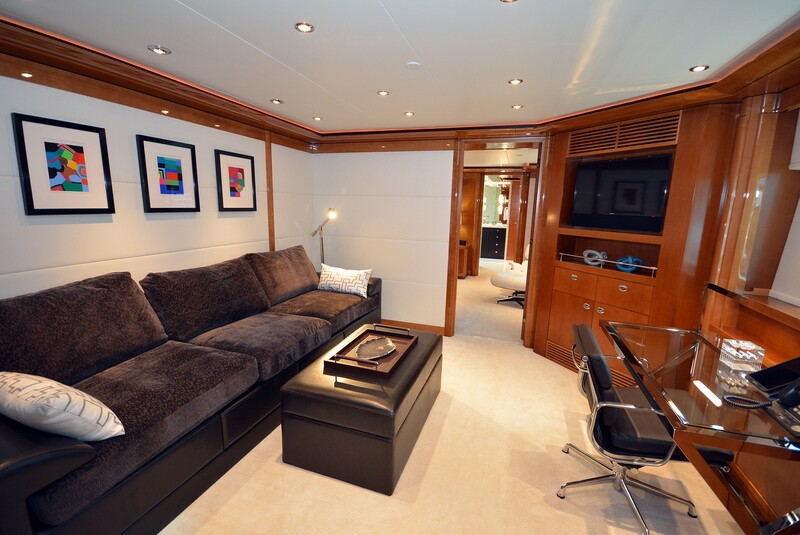 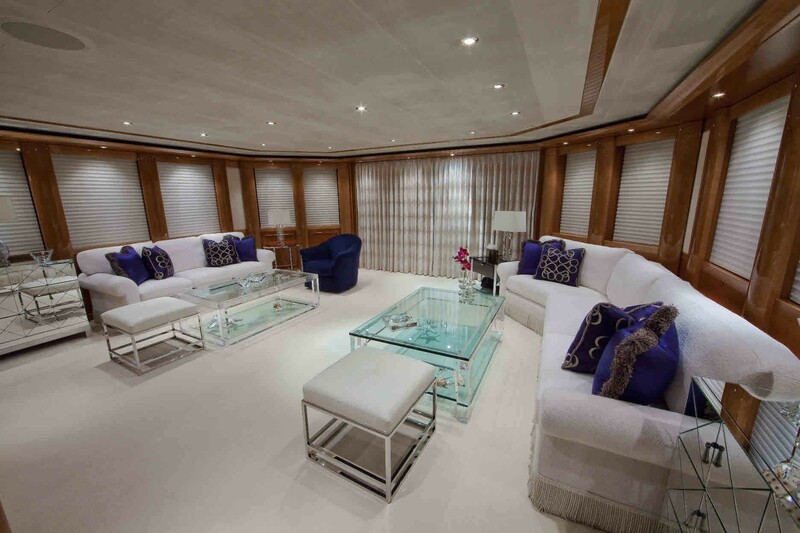 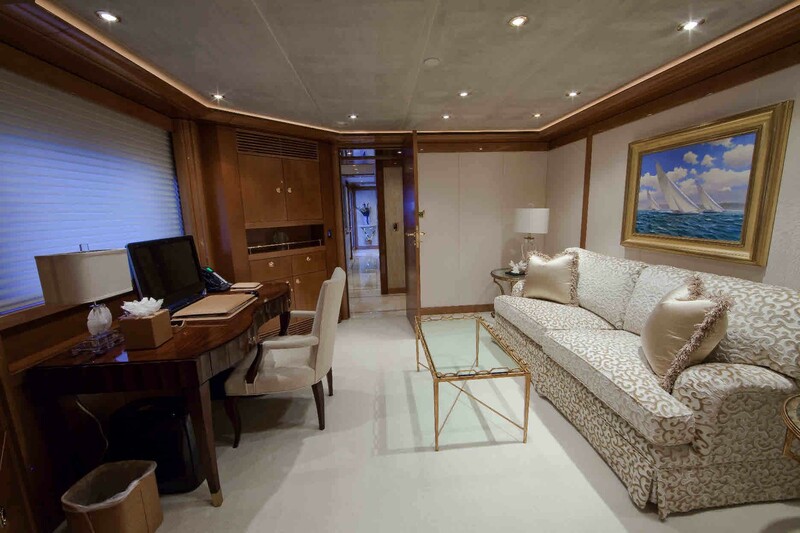 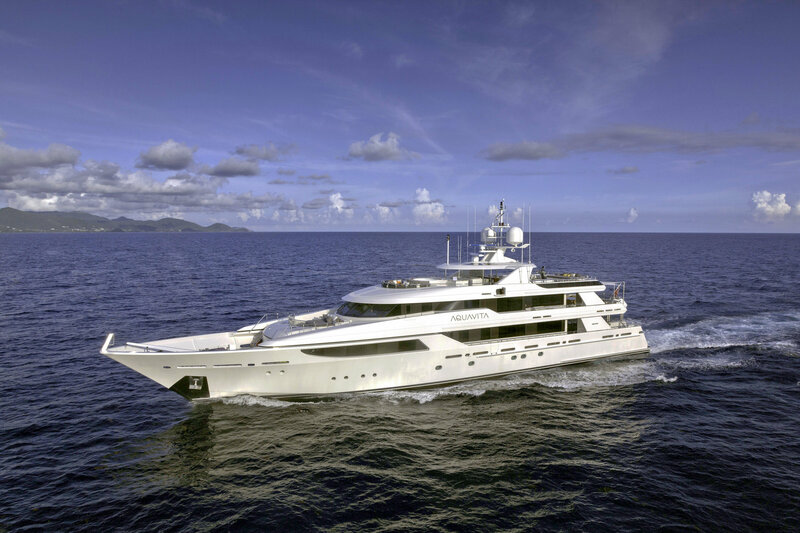 Motor yacht AQUAVITA delivers on exterior living space. 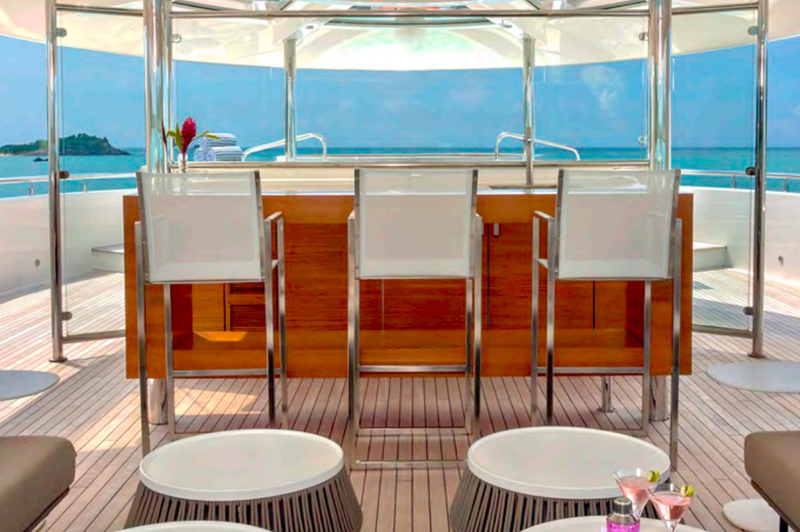 The main deck offers direct access from the adjacent salon aft, where guests may dine alfresco and enjoy an evening cocktail from the wet bar. The upper deck features an adjacent aft deck from the sky lounge, complete with an alfresco dining option, seating, entertainment and partial shade. 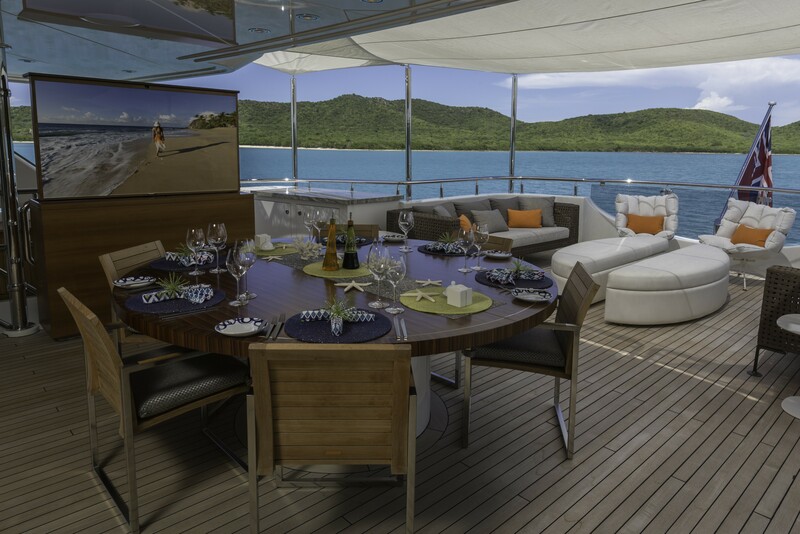 The upper deck wraps around offering 360° access, leading forward to a massive sun pad, which easily converts into a further alfresco dining option. 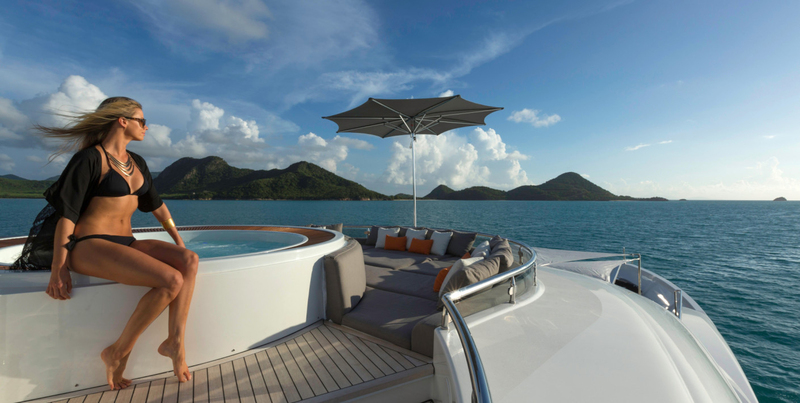 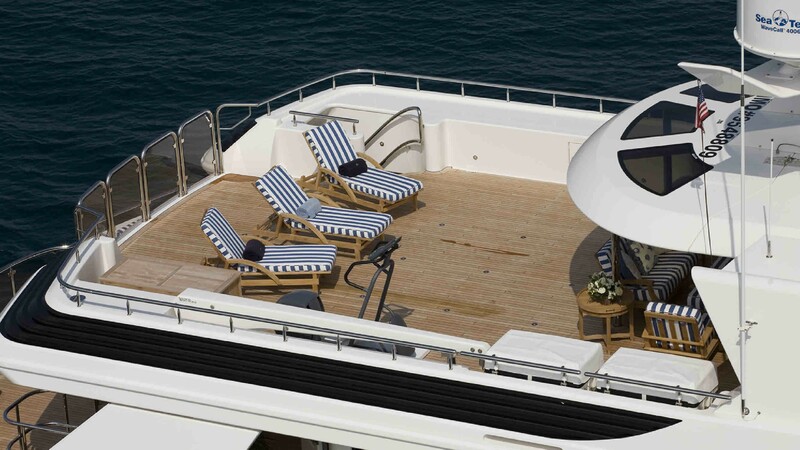 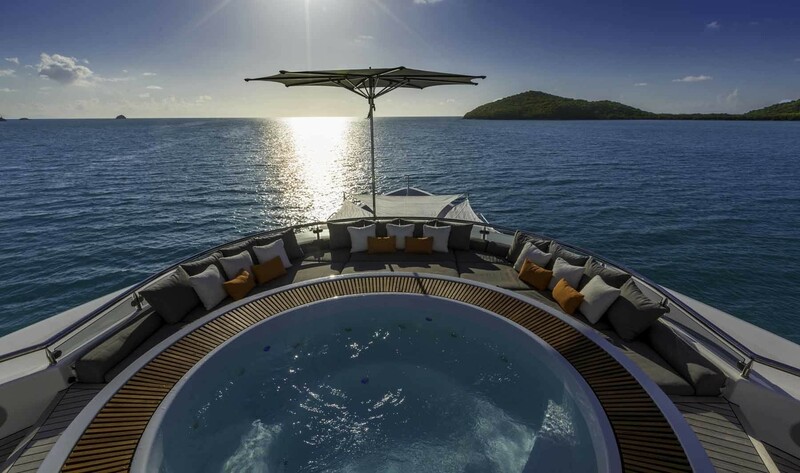 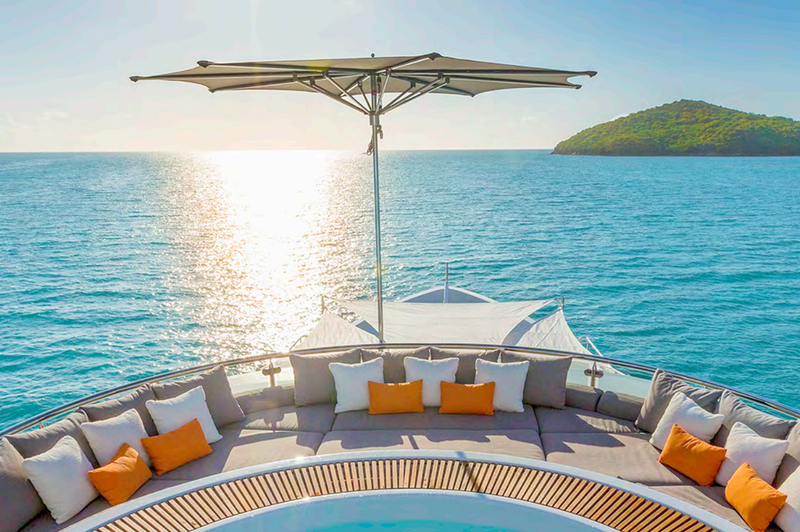 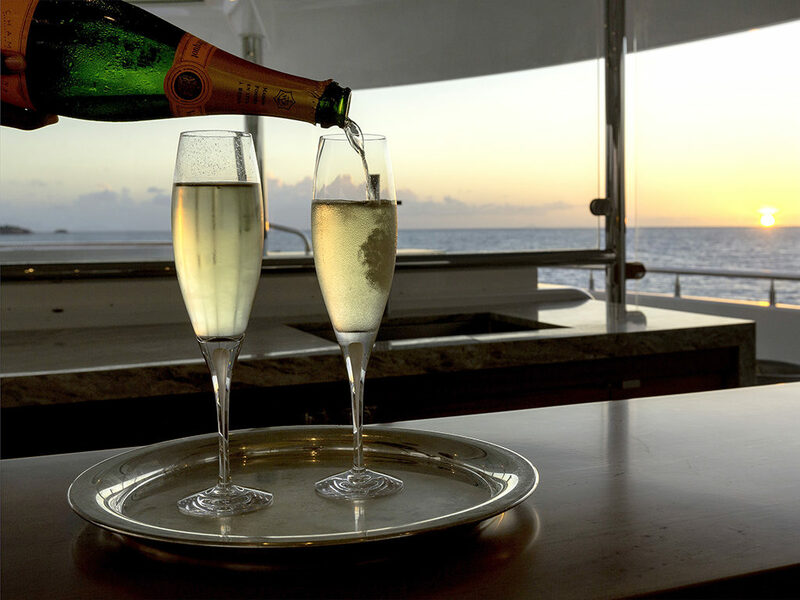 The sundeck is perfect for the sun lovers and casual entertaining, offering two large sun pads, oversized seating, service area, exercise equipment and deluxe Jacuzzi tub. 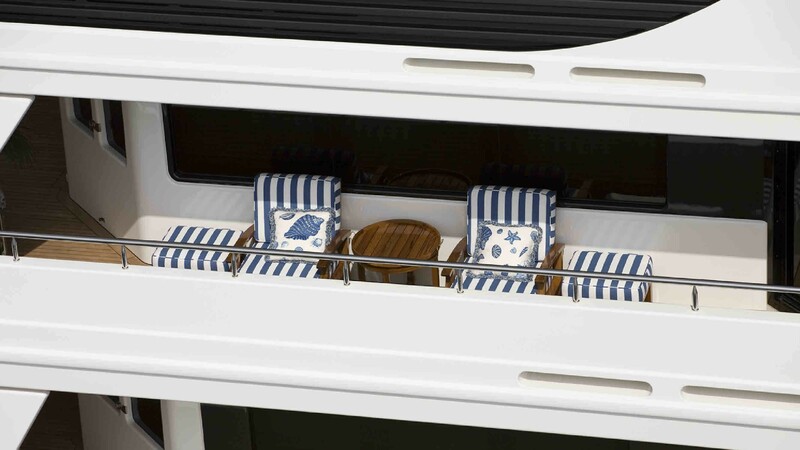 For the water enthusiasts, the extended swim platform on the transom provides effortless water access to the many water toys on offer. 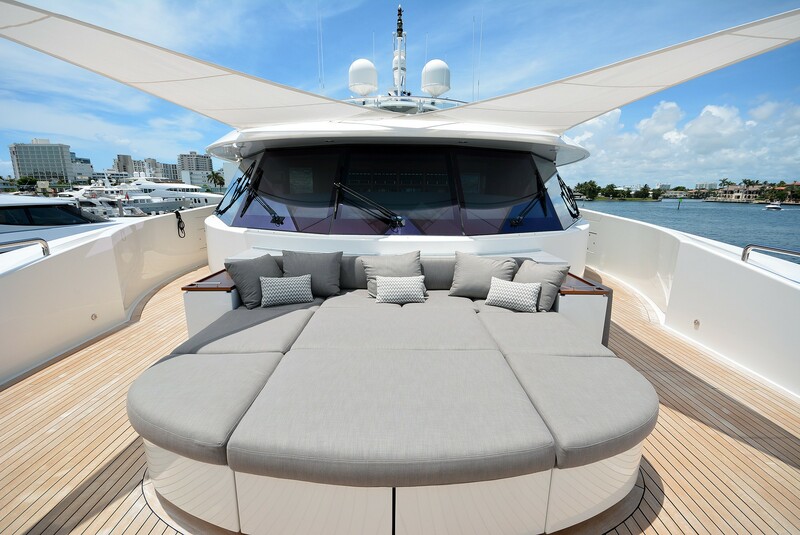 Powered by twin MTU 3650hp engines, AQUAVITA motor yacht cruises comfortably at 17 – 18 knots, reaching top speeds of 25 knots. 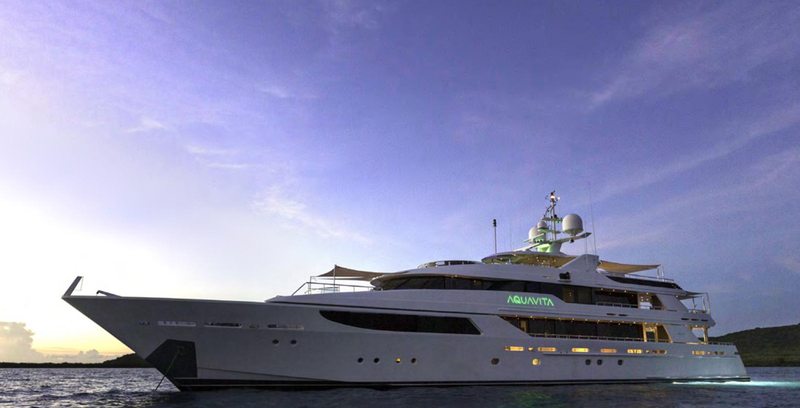 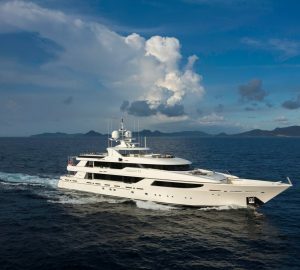 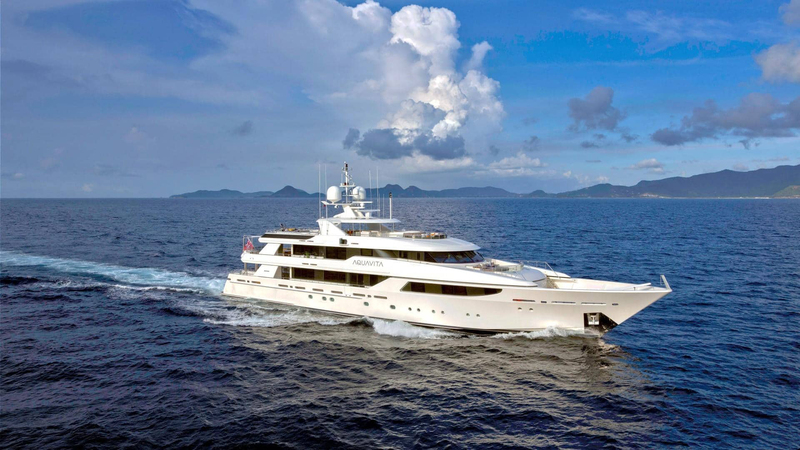 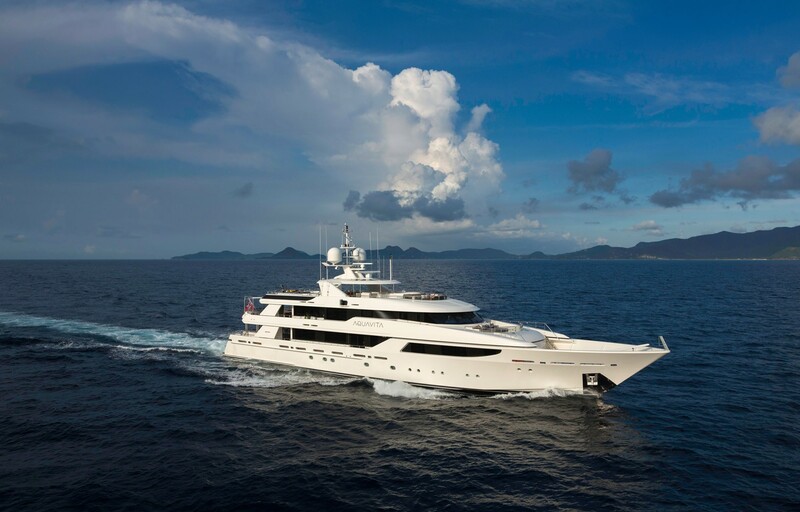 Fitted with underway and at anchor stabilizers, M/Y AQUAVITA boasts a smooth luxury charter yacht experience. 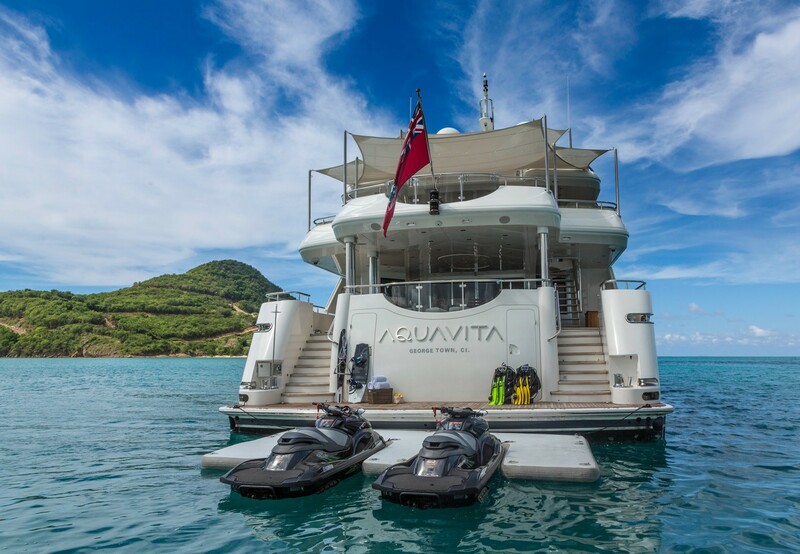 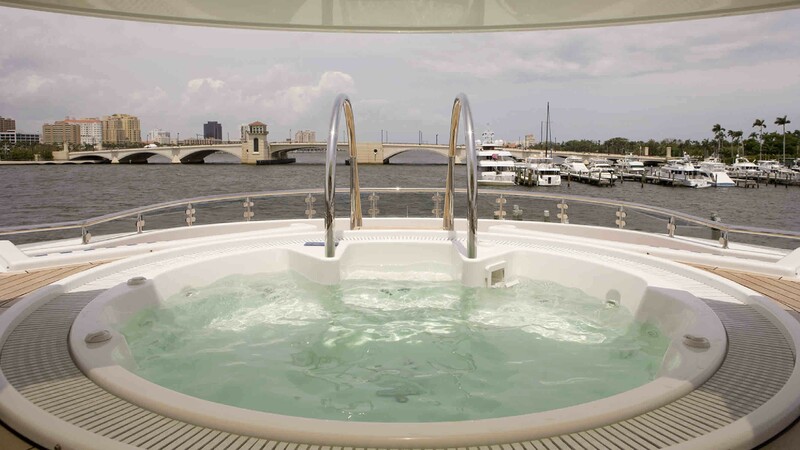 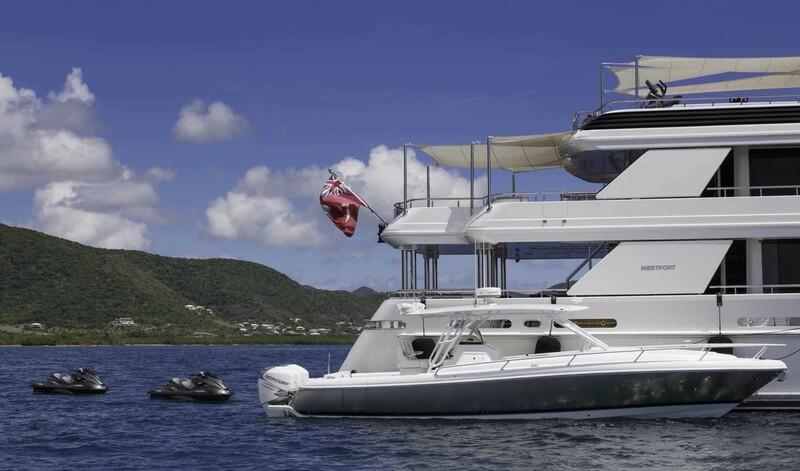 Motor yacht AQUAVITA can accommodate up to 12 charter guests in 6 spacious cabins, all offering private en-suite facilities. 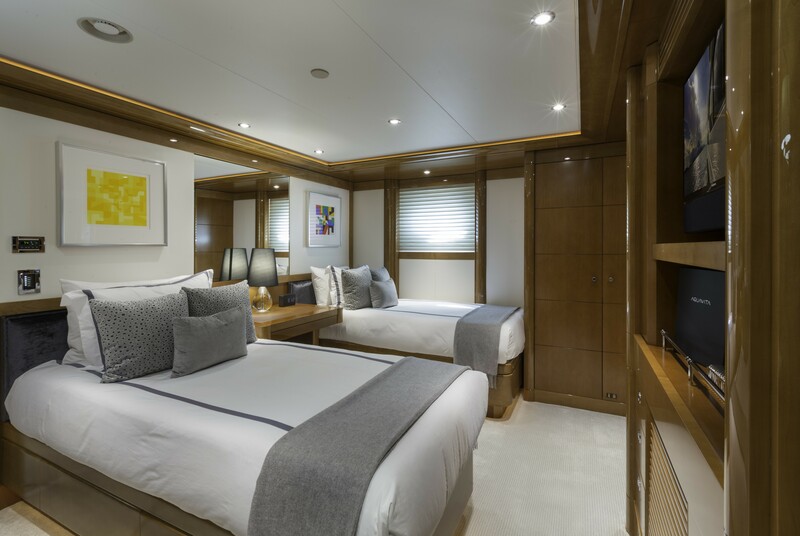 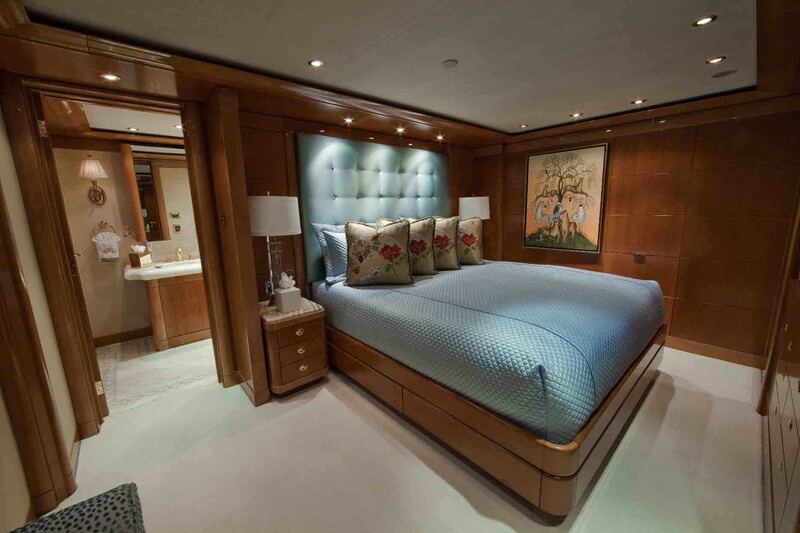 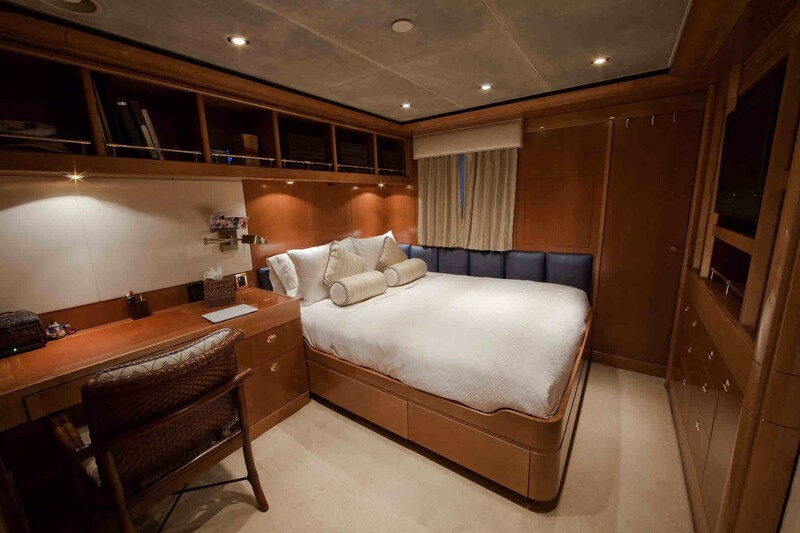 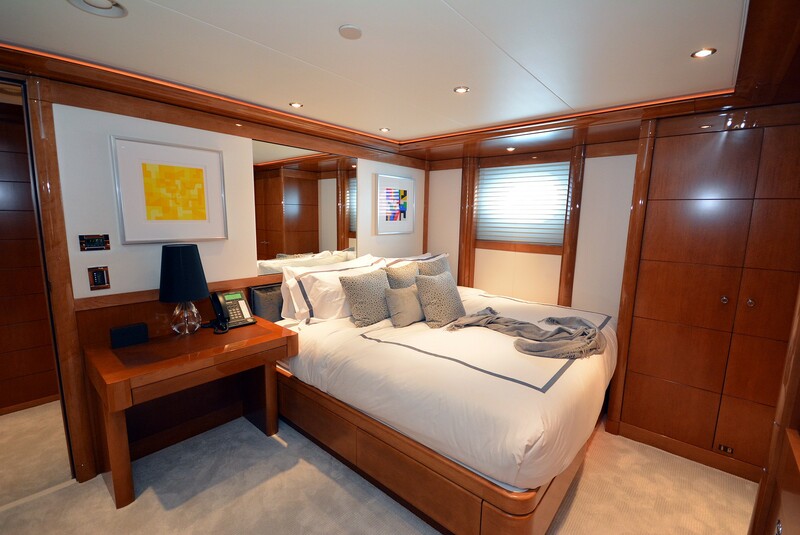 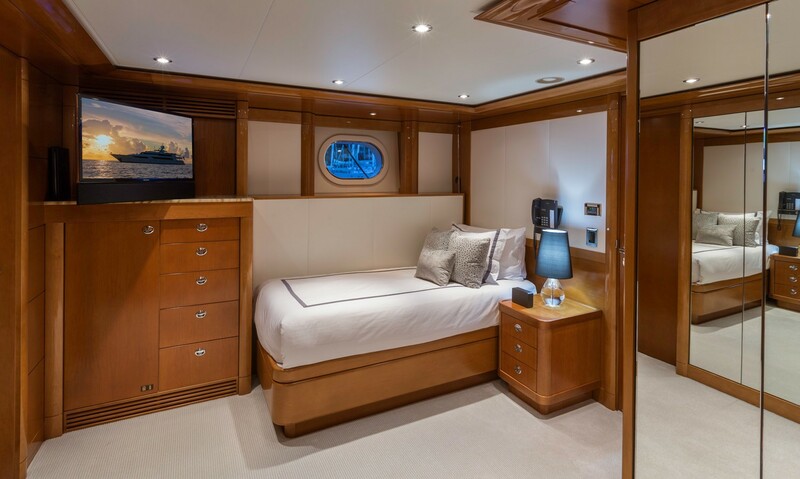 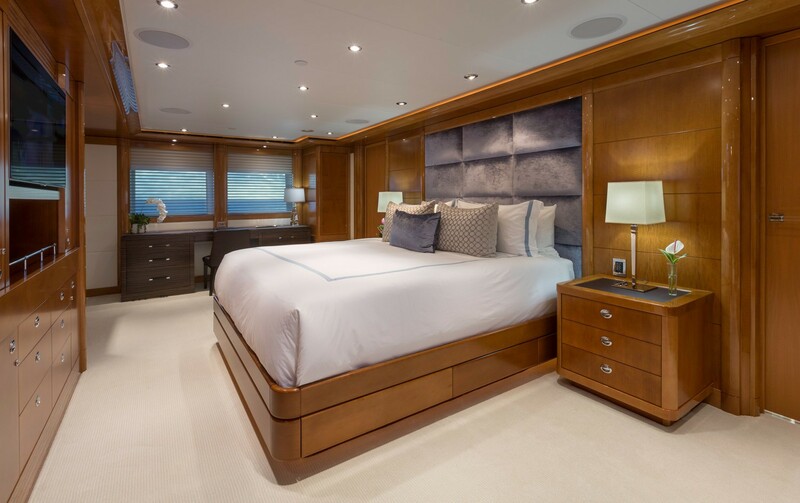 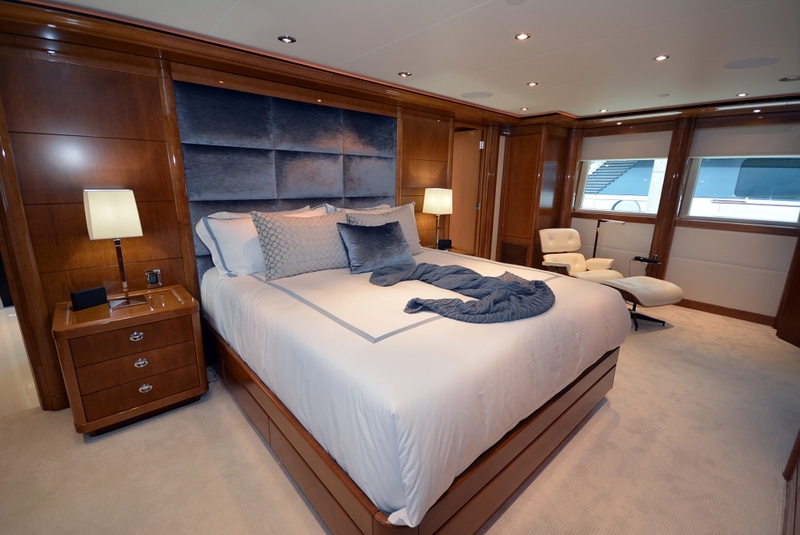 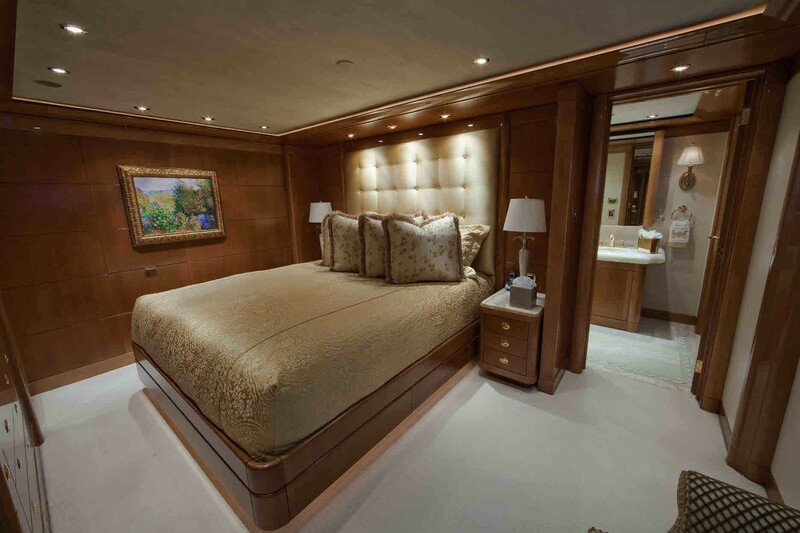 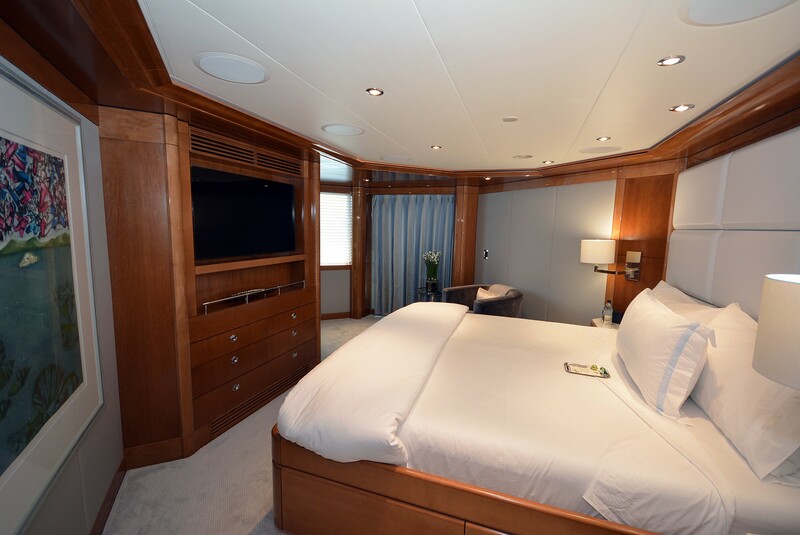 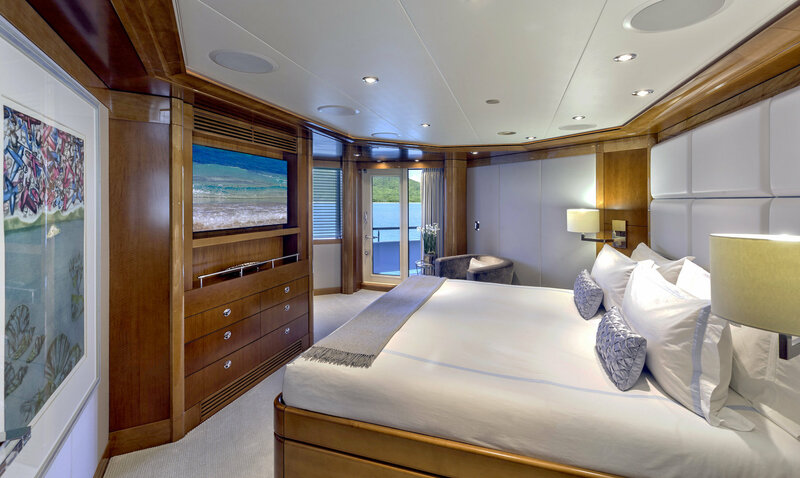 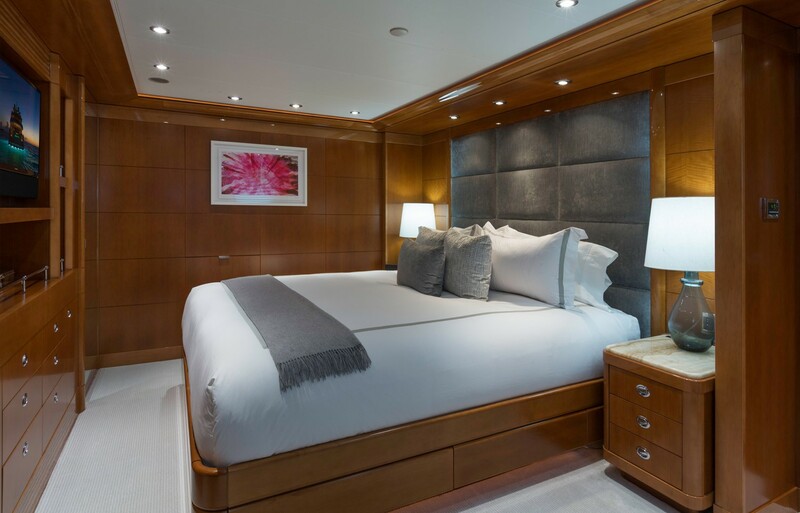 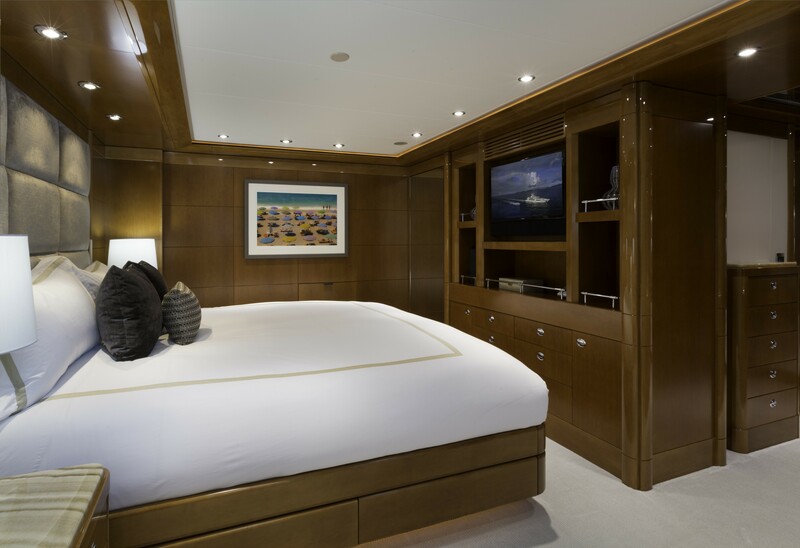 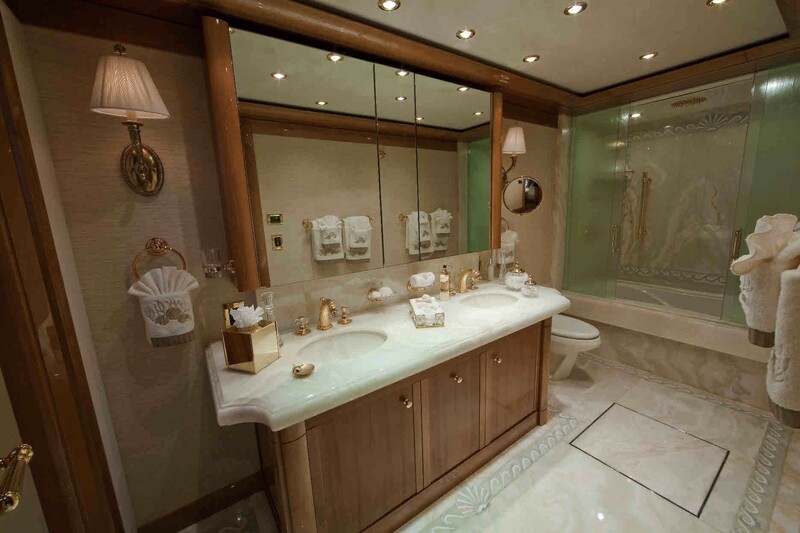 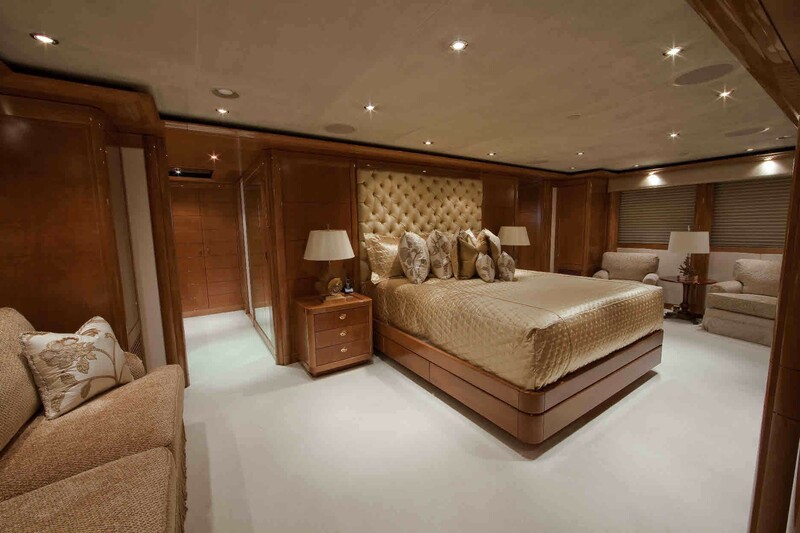 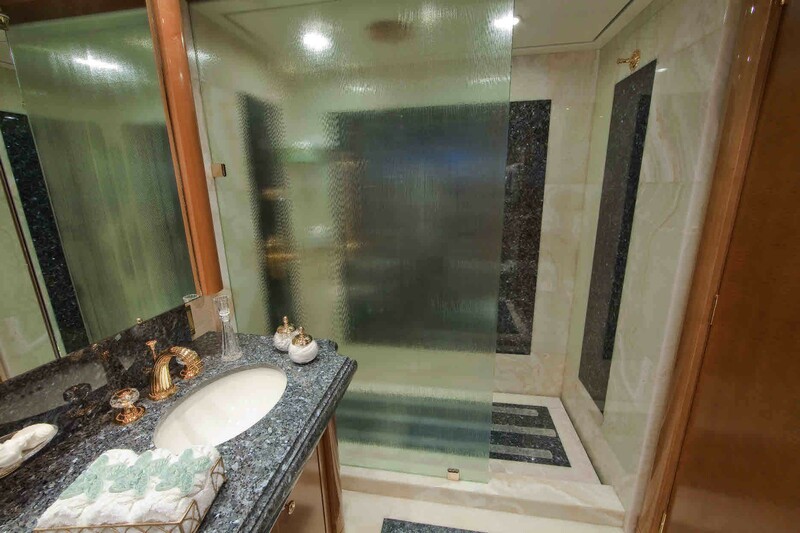 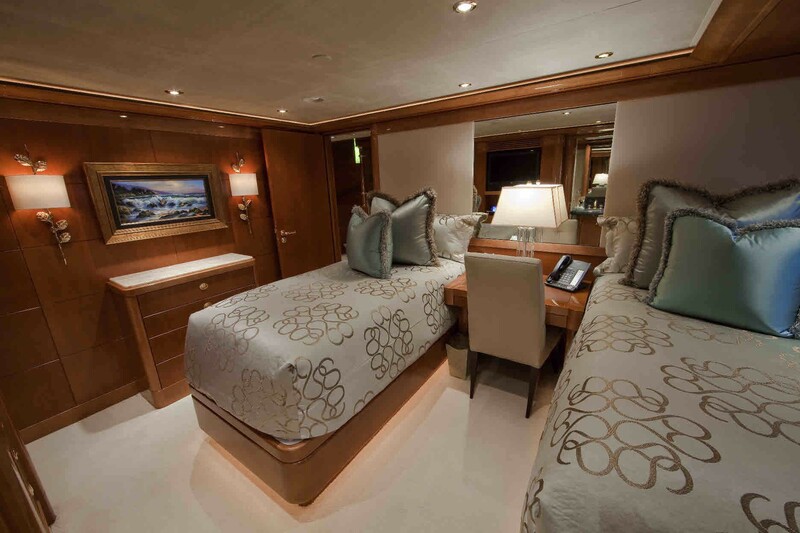 The master stateroom is on the main deck, forward of the main salon and marble foyer, featuring a separate study, followed by a full beam cabin, with king size bed, ample storage and generous en-suite. 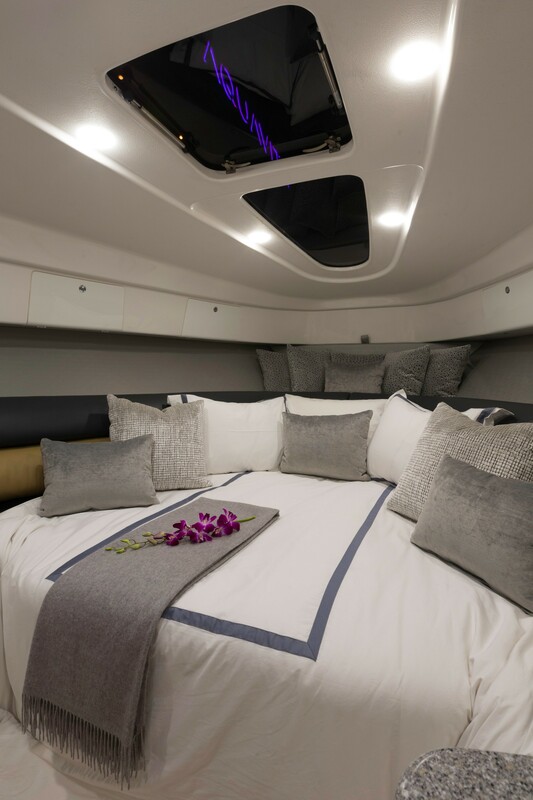 The VIP cabin is on the upper deck, forward of the sky lounge, boasting a king size bed. 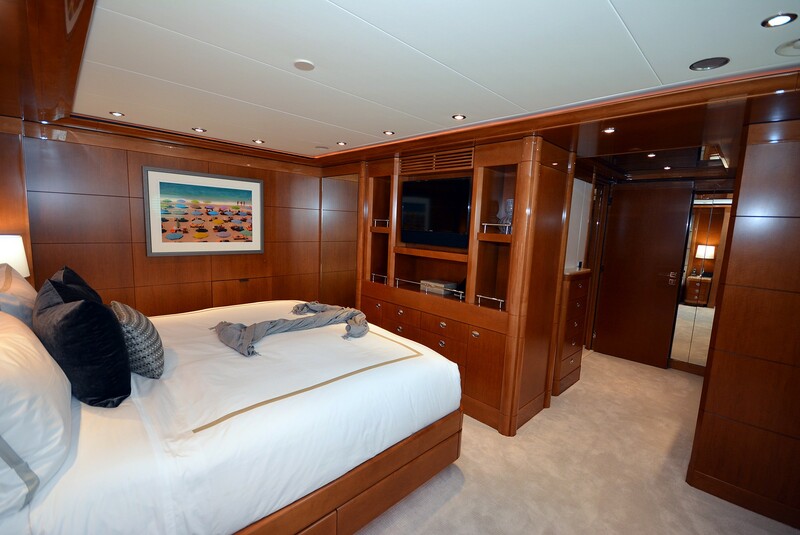 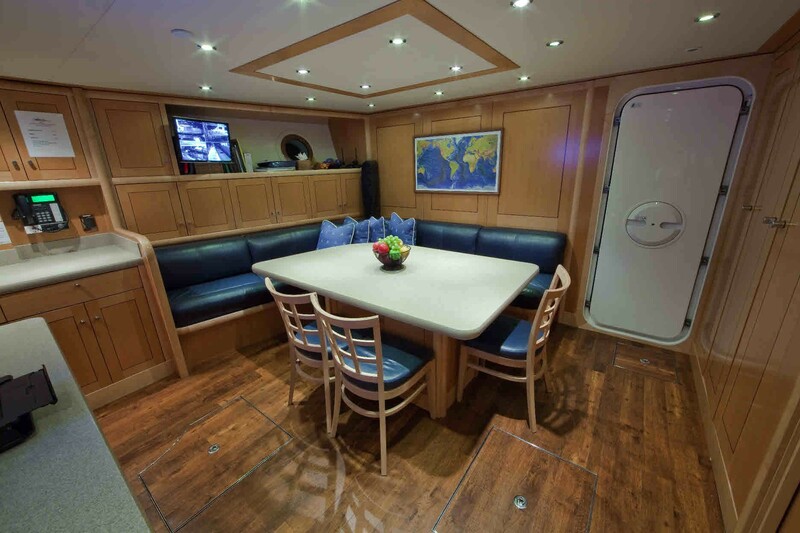 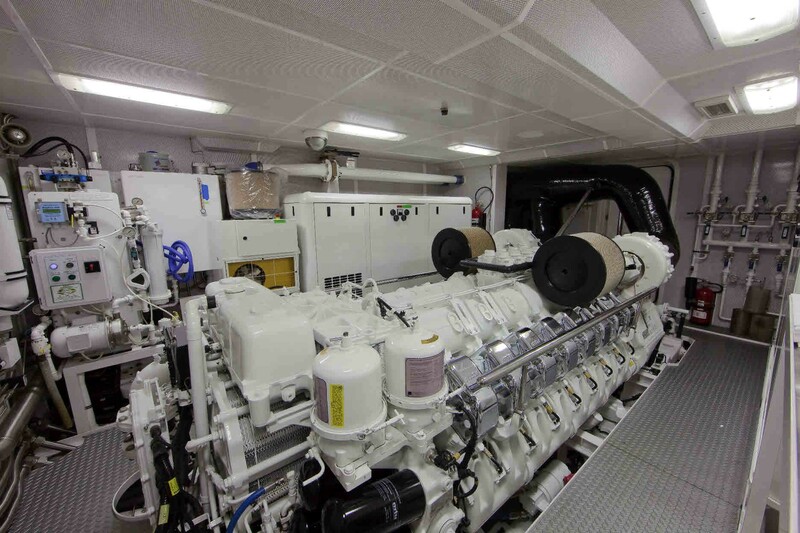 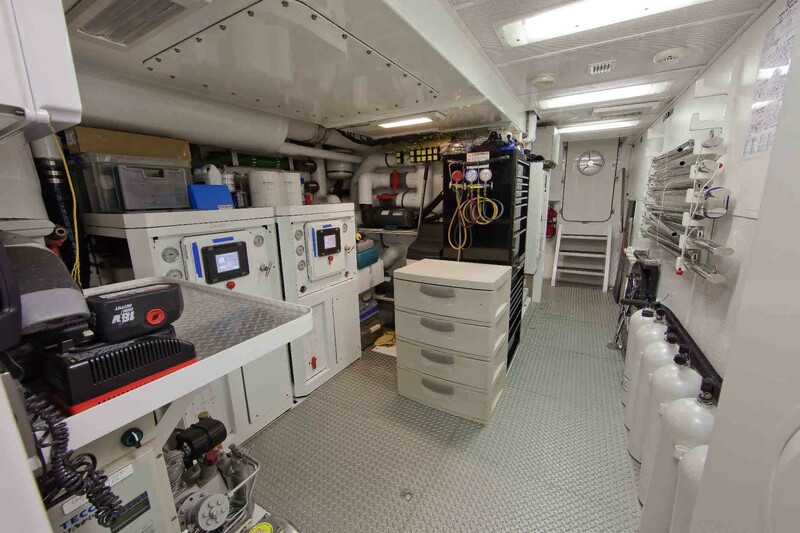 Below decks, are 4 further guest cabins, 3 with king size beds and one with twin beds. 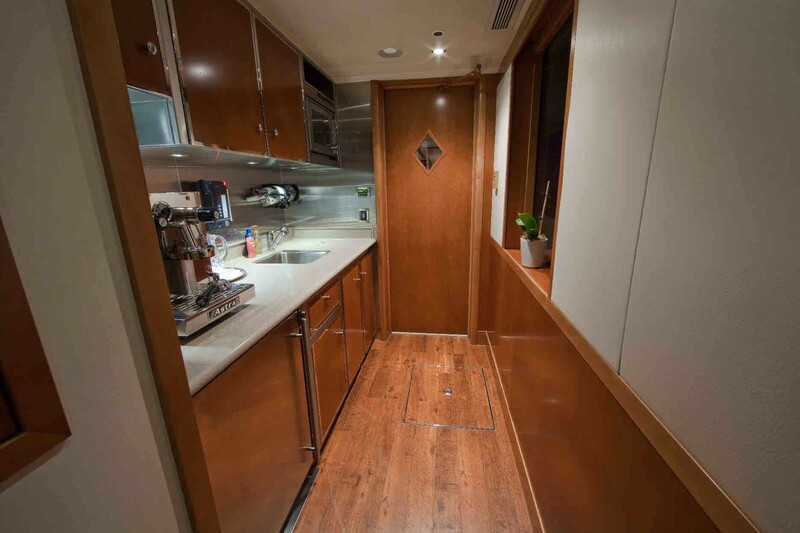 One king size guest cabin easily converts into a twin cabin, creating versatile accommodation, ideal for families and friends alike.